Nurburgring. Internally known as G20, the next 3 Series should hit dealer showrooms sometime in 2018. The 3 Series has always had a target on its back, but competitors like the Mercedes-Benz C-Class and Jaguar XE are closer than ever to stealing its sports sedan crown. 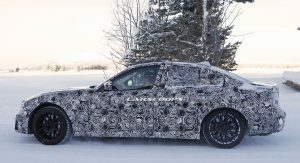 Not wanting to lose its position as the benchmark of the segment, BMW is pulling out all the stops for its next-generation 3 Series. 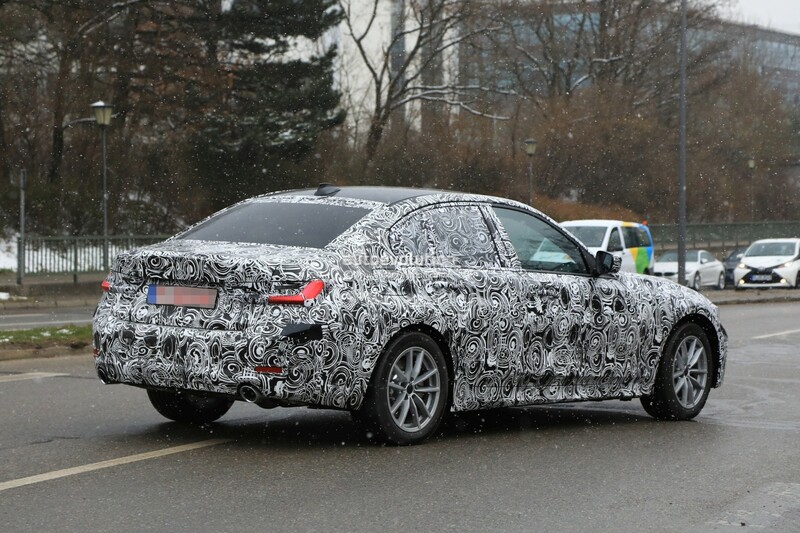 Although the overall look of the 3 Series won't radically change, it will become more refined. Think tighter cut lines, sharper creases and harder edges. 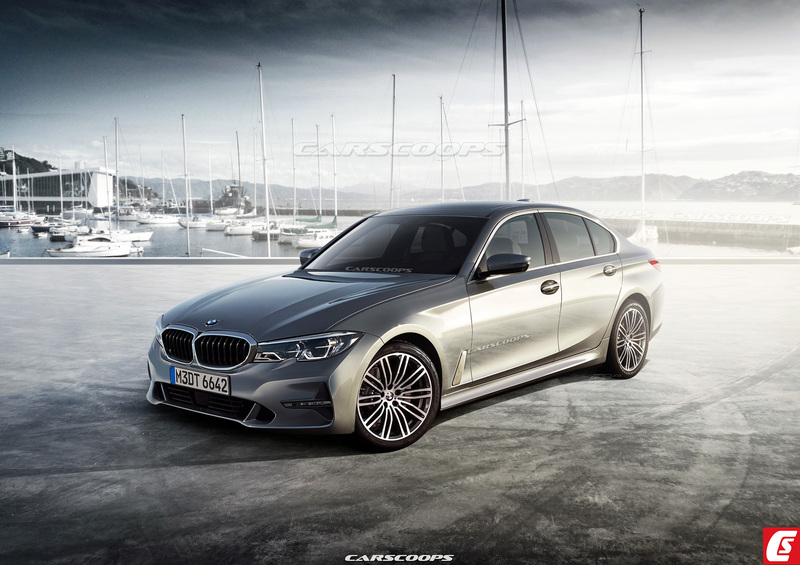 The 3 Series sedan is also expected to adopt a wider stance and a sloping roofline for a sportier appearance. The interior of the next 3 Series will be much improved over the current model with an emphasis on better materials and more advanced infotainment. Overall the cabin of the 2018 3 Series should have a much more luxurious feel. The G20 3 Series will ride on BMW's new CLAR rear-wheel drive platform. Like the current 3 Series, a wide range of engines will be available. 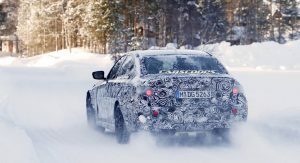 BMW's xDrive all-wheel drive system will also be offered for enhanced traction. The next-generation 3 Series will like bow in 2018 as a 2019 model. A high-performance M variant is also expected. 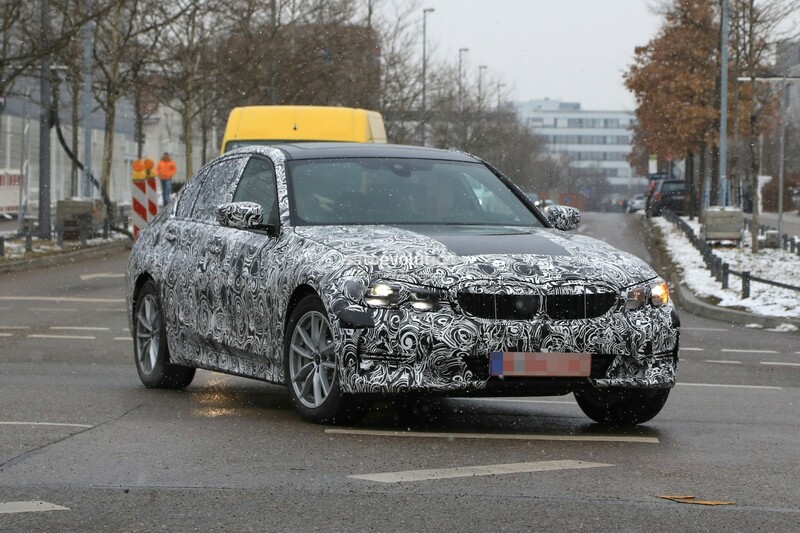 Feast your eyes on the latest spy shots of a prototype for BMW’s next-generation 3-Series, arguably the automaker’s most important model of the next few years. It is expected to be revealed in late 2017 or early the following year, as a 2019 model. 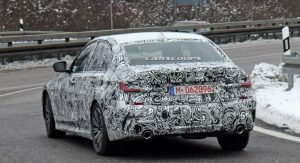 Like past generations, this new 3-Series, code-named the G20, will likely end up the benchmark for the small sedan segment when it comes to important metrics such as driving dynamics and performance. However, Mercedes-Benz and even Cadillac with their latest small sedan offerings have left BMW in catch-up mode. Fortunately for BMW, its engineers have developed one of the most advanced platforms in the business. That platform is the multi-material constructed CLAR modular design that made its debut in the 2016 7-Series and has since appeared in the 2017 5-Series. The platform incorporates lightweight materials such as aluminum, magnesium and, in the case of the 7-Series, carbon fiber-reinforced plastic. It should bring weight savings of around 88 pounds for the 3-Series. It can also support alternative powertrains including plug-in hybrid and battery-electric applications. 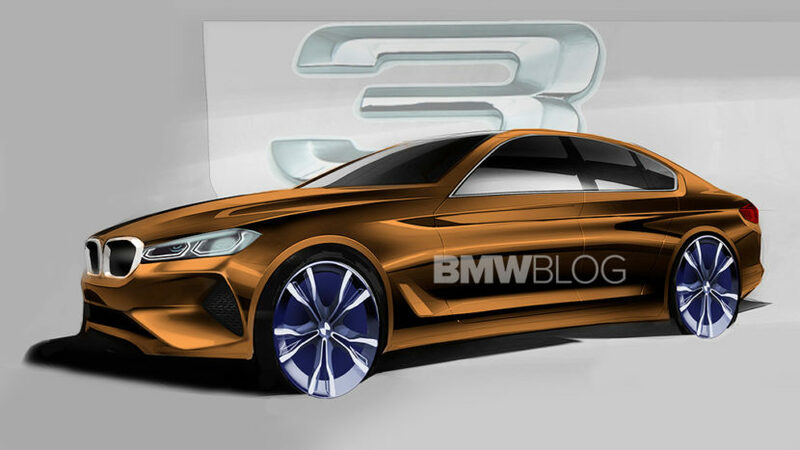 The 3-Series will be BMW’s smallest model spawned from it. Looking at the spy shots, evolutionary styling has clearly been adopted. All the signature BMW styling cues are present, such as the kidney grille, Hofmeister kink and short overhangs. 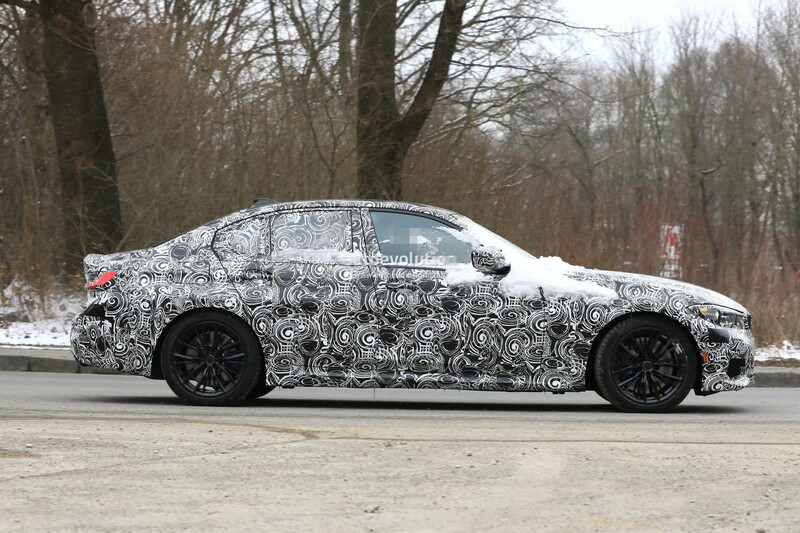 However, the front of the car appears lower and wider than before, which should give the new 3-Series a very sporty look, just like Jaguar’s svelte XE. Though it’s hard to gauge from the grainy shot of the interior, it looks like there’s a digital instrument cluster. This will likely be teamed with an advanced infotainment system complete with voice activation and gesture control. The driver should also have access to full a suite of electronic driver aids including some semi-autonomous modes. Diesel and plug-in hybrid options should be available in most markets, with the latter possibly utilizing two electric motors (one driving the front axle and the other integrated with the transmission) in a setup known as Power eDrive. BMW’s current plug-in hybrid 3-Series relies on a single electric motor integrated with the transmission. 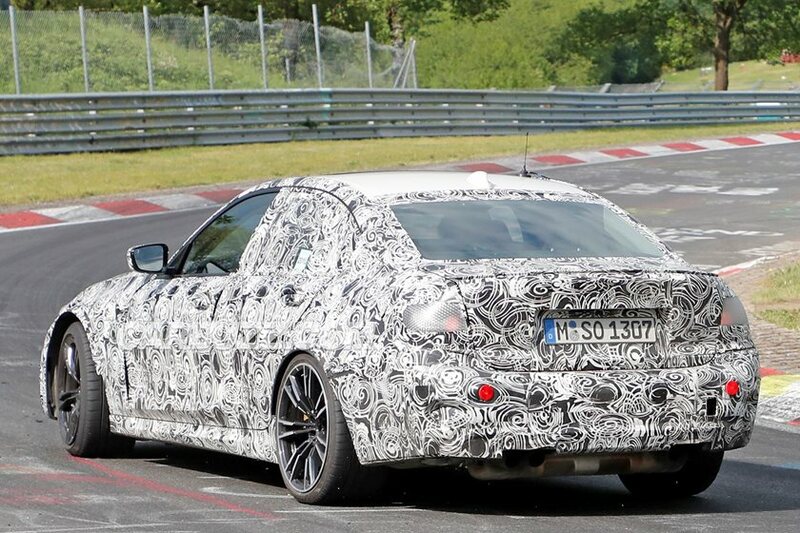 Of course, there will also be a high-performance M3 variant. Don’t be surprised if this one gets the Power eDrive system mentioned above. A prototype version of the system shown in 2014 used a turbocharged 2.0-liter inline-4 and two electric motors to develop as much as 670 horsepower! 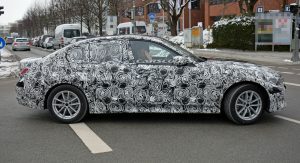 What It Is: The BMW 3-series gets completely redesigned for the 2019 model year, and these images are our clearest look yet at what we can expect from the all-new compact luxury sedan. 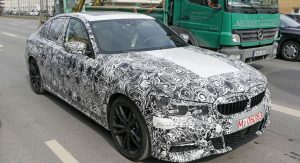 Like its bigger 5- and 7-series stablemates, the new 3-series features large headlights that appear to merge into the brand’s classic kidney grille design. That grille will employ shutters that open and close at higher speeds in order to improve aerodynamics and fuel economy. 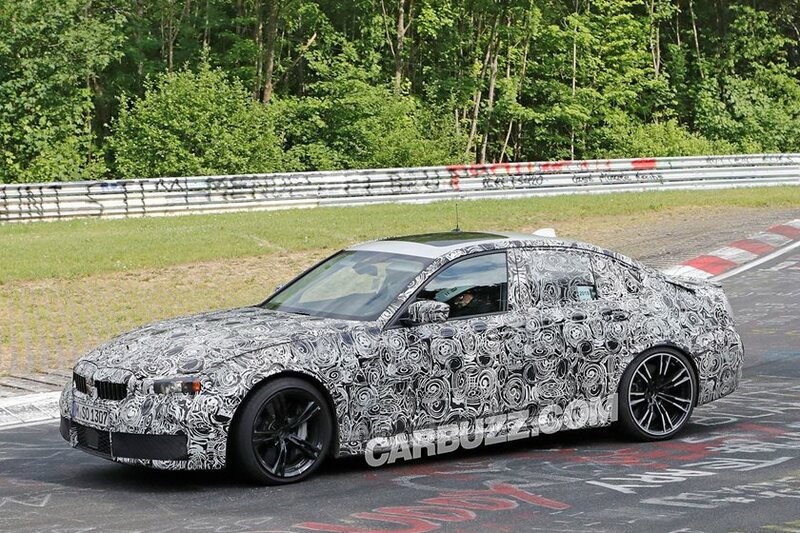 Meanwhile, the 3’s body sides will include a handful of character lines that sweep across the car’s four doors. Expect the front fenders to house a pair of functional vents that mimic those on other BMW models. 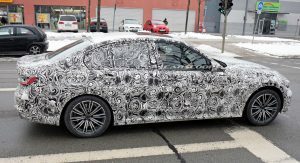 Change also is afoot inside the new 3-series, which appears to usher in a new iDrive control knob, new center-console buttons, and model-specific seats. 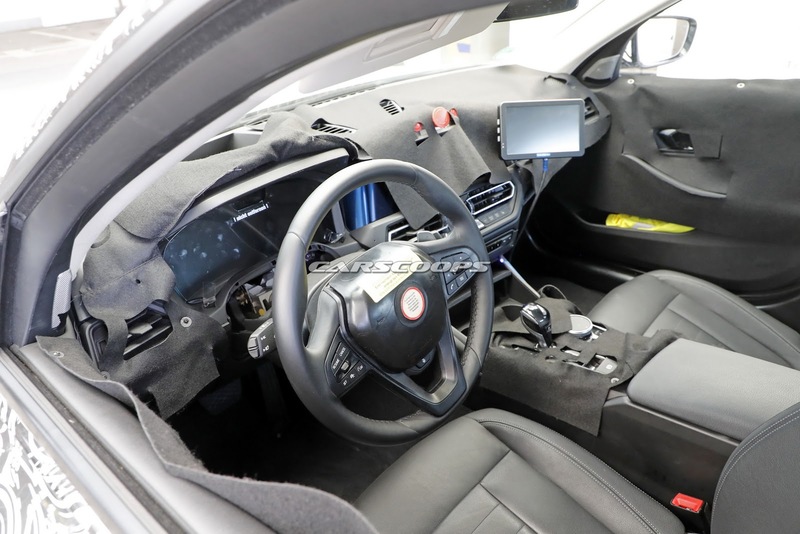 As in other recent BMWs, the new 3 will have a center stack that’s curved toward the driver, and it will offer an optional digital gauge cluster and the latest iDrive software, which will include a touchscreen that works in conjunction with the console-mounted control knob. Why It Matters: Traditionally BMW’s best-selling model, the 3-series is key to the company’s financial success, even as the market focus shifts to crossover SUVs. 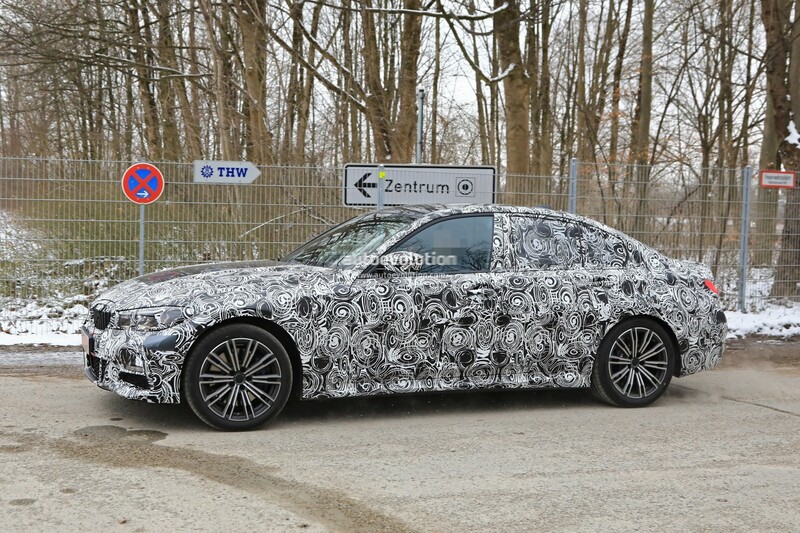 More important, the new 3-series will set the tone for BMW’s future as an enthusiast marque. While the 5- and 7-series have lost the inherent behind-the-wheel joy of BMWs past, we’re hopeful that the new 3-series will bring BMW back to its dynamic roots, which were established by four generations of 10Best Cars winners. 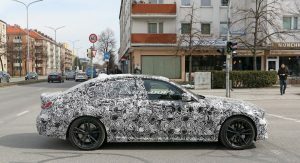 Platform: The 2019 BMW 3-series will ride on the brand’s new “cluster architecture” platform, dubbed CLAR. (That platform also underpins the 5-series, the 7-series, the new 6-series Gran Turismo, and the new X3.) Expect the new car to weigh slightly less than its predecessor but ride on a marginally longer wheelbase and cast a larger overall shadow. Engines will continue to be longitudinally oriented, and the plug-in model’s battery pack is expected to be unobtrusively mounted under the floor. Powertrain: The 3-series’ four-cylinder gas engines are said to carry over to the new car unchanged, plus or minus a few horsepower. Base models likely will continue to bear the 320i badge and rely on a turbocharged 2.0-liter inline-four with about 180 horsepower, while 330i models will pack roughly 250 ponies. 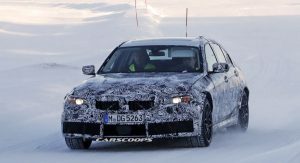 Rear-wheel drive will be standard, with optional all-wheel-drive models getting the usual xDrive badge. 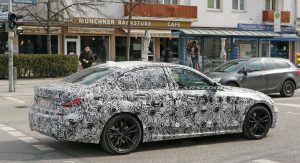 The six-cylinder 340i may give way to a harder-edged M340i M Performance model with approximately 350 horses that will allow the 3-series to properly battle the Audi S4 and the Mercedes-AMG C43. The plug-in-hybrid 330e is expected to see upgrades that will improve upon the current model’s paltry 14-mile all-electric EPA driving range. 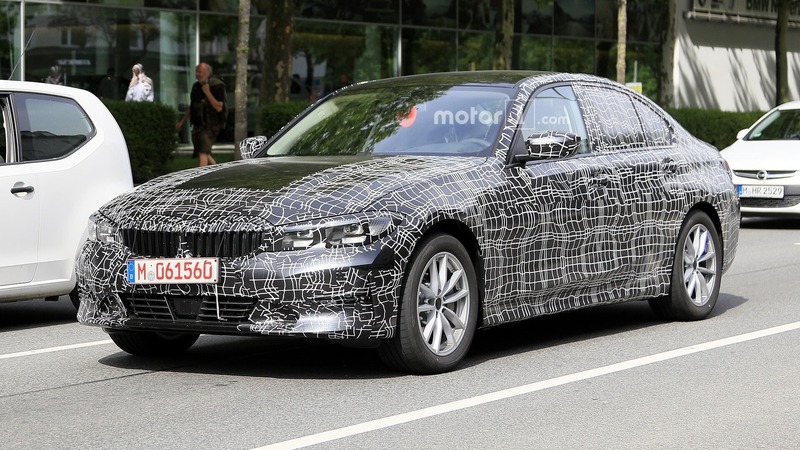 Additionally, BMW is expected to introduce a fully electric version of the new 3-series. The model will be aimed directly at the Tesla Model 3, and it should have more than 200 miles of range. All 2019 3-series trim levels will use an eight-speed automatic; it’s possible that the manual transmission won’t make it to America. Across the pond, BMW is poised to offer a 3-series motivated by the Mini Cooper’s turbocharged three-cylinder. We don’t expect to see this engine under the hoods of U.S.-bound 3-series models. 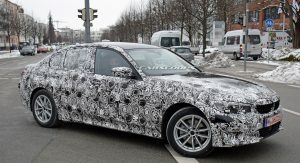 Estimated Arrival and Price: Look for the next-generation BMW 3-series to arrive in the middle of 2018 as a 2019 model-year vehicle after debuting at the Frankfurt auto show this September. Pricing should stay close to today’s cars, with four-cylinder models starting in the mid-$30,000 range, the plug-in hybrid adding another $5000 or so to the ticket, and the six-cylinder versions pushing well past $50,000. The G20 3 Series has finally revealed some production parts as we now get our first look at the production LED headlights and tail lights. These headlights feature a closed loop design. It remains to be seen whether these are intended for the base model, with higher end models featuring the current open L-shaped styling. And while we now see the lighting elements of the production tail lights, their overall shape is still obscured by the camouflage. 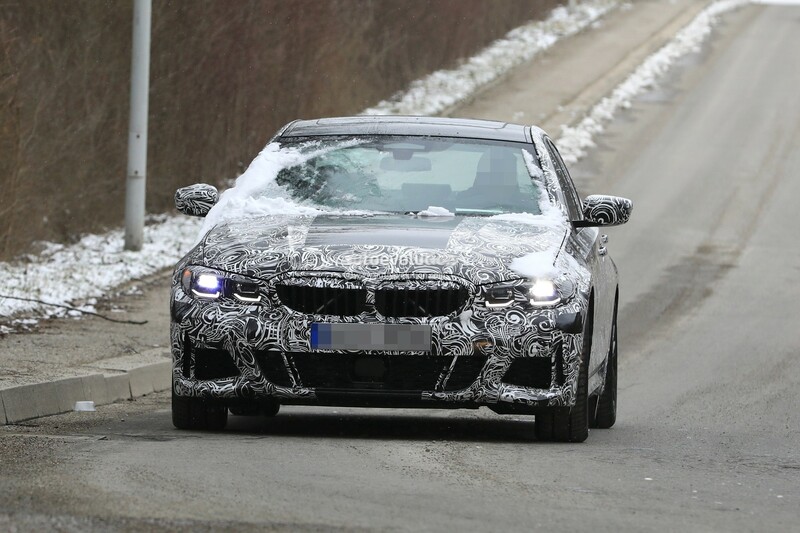 What do we know about the upcoming 2019 G80 BMW M3? Now that there are several new competitors in the segment, the BMW M3 has become desperate for a replacement. The Mercedes-AMG C63 S, Alfa Romeo Giulia Quadrifoglio and Audi RS4 are all brand-new cars that compete with the BMW M3 and there can be a case made for each as to why it’s better than the current M3. 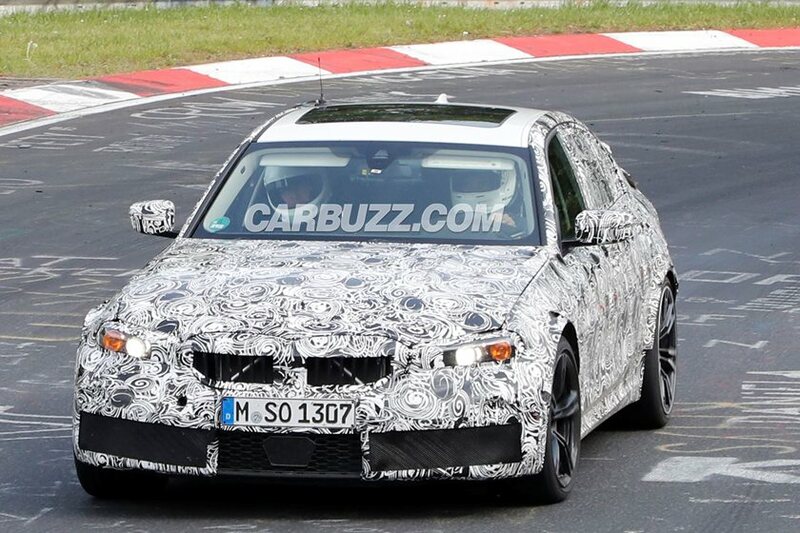 Thankfully for BMW enthusiasts, a new M3 is on the way. 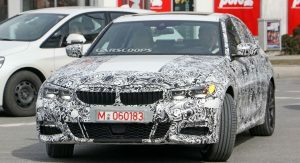 Much of the info about the upcoming M3 is still unknown. However, we do have a good idea as to some of what the new M3 might bring. So here’s some of what we know. 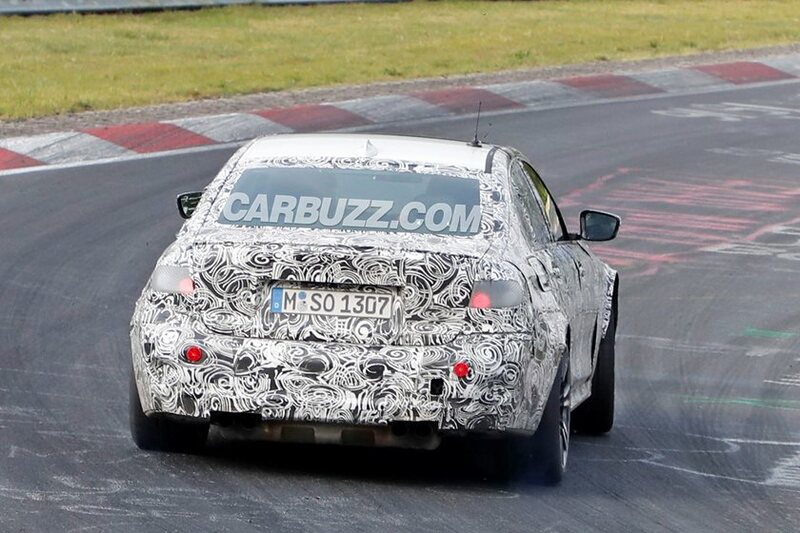 We know that the upcoming M3 will still use a 3.0 liter twin-turbocharged I6 engine. Whether its a tuned version of the current S55 engine or not, it will still be a 3.0 liter turbo-six. That engine is said to make somewhere around 500 hp, thanks to a 48-volt electric system and a rumored water-injection. While we’ve heard that the M3 will use water-injection, and that would help the engine make about 500 hp, as it does so in the M4 GTS, there are still some issues BMW has with it. Most of the issues have to do with the water tank. Not only is it small and would have to be refilled ever so many miles, which is annoying to customers, but you also have to worry about water freezing in colder climates. To be honest, water-injection seems like an unnecessary complication. If Alfa Romeo can make a 2.9 liter twin-turbo V6 make 505 hp, BMW can do so with a twin-turbo I6 without water-injection. 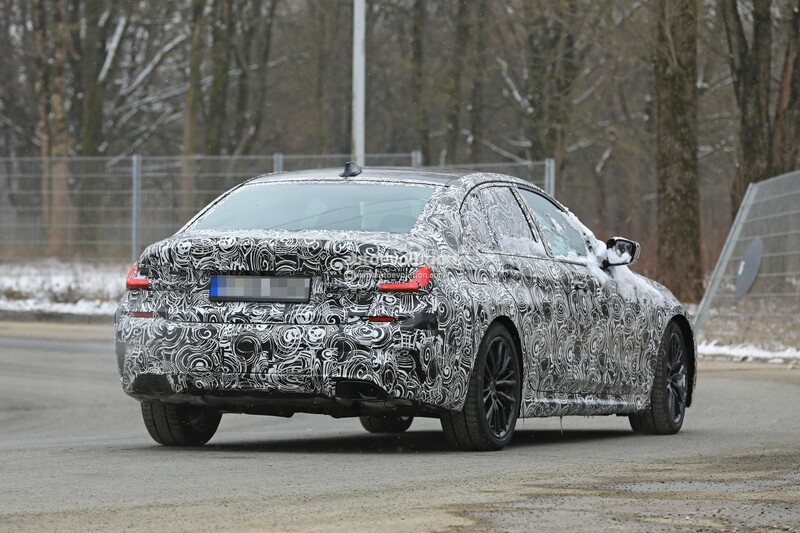 Being built on BMW’s latest CLAR architecture, expect quite a lot of carbon fiber used in the new BMW M3. It should get the same carbon fiber roof as every other current BMW M car and it should also have some carbon fiber in the chassis structure. 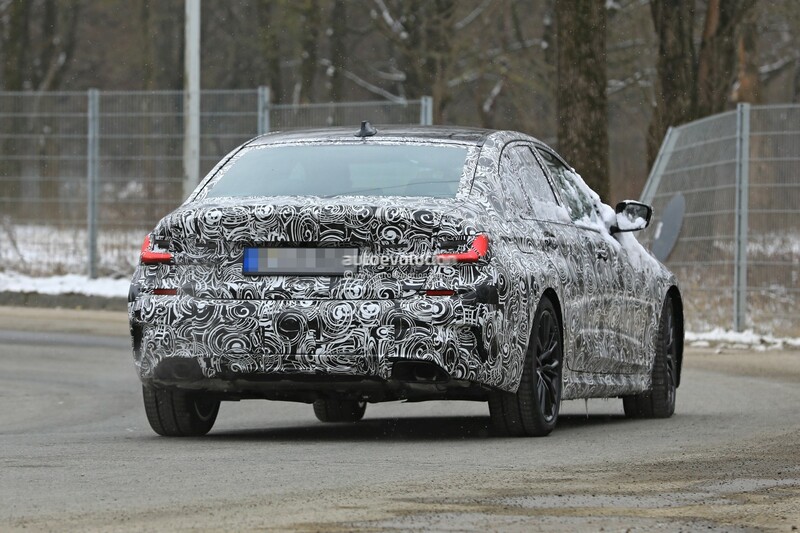 So the upcoming G80 BMW M3 will be lighter than the outgoing car, while also having more power. 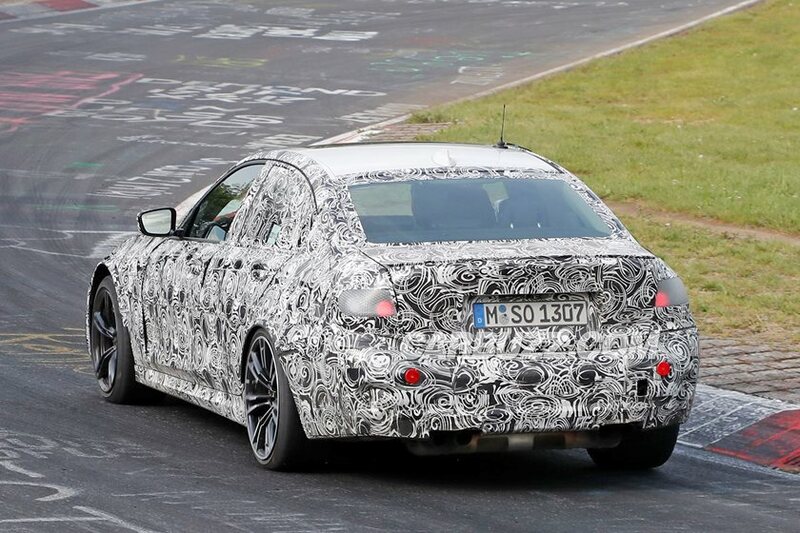 We’ve heard rumors that the upcoming BMW M3 could be the first BMW M car to feature a hybrid powertrain. While it’s not likely, BMW M is playing with the idea of adding electric motors and a battery to M cars. So long as the famous brand can do it without sacrificing handling integrity, there’s a possibility that the new M3 could be a hybrid. 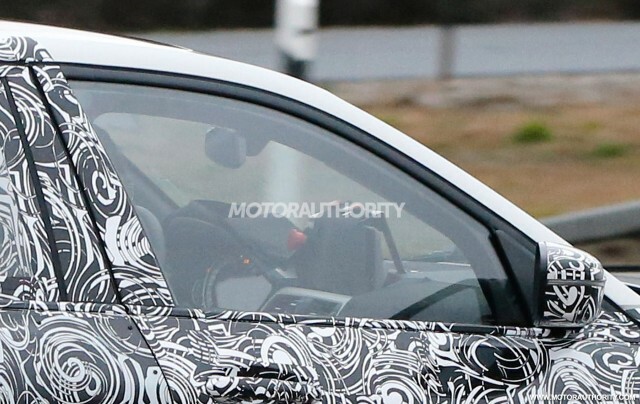 It’s getting a 48-volt electric system, so it’s also possible that the new M3 is a MHEV (Mild Hybrid Electric Vehicle). That means it could sport a BAS (Battery Alternator Starter), which, quite crudely put, is sort of like an electric motor connected to the crankshaft that can act as the starter motor but also take over powering the engine. So at highway speed, it can allow the engine to shut down but still spin the crankshaft, adding just enough power to keep the car going at speed. It can also add a bit of power at low rpm, while the turbos are still spooling. Though, it’s not a plug-in hybrid. 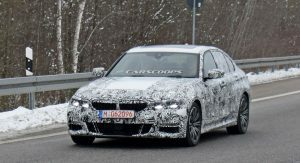 This new F90-generation of BMW M5 is the first ever non-SUV BMW M car to have all-wheel drive. Thanks to spinning four wheels, the new M5 is the fastest accelerating BMW ever made. 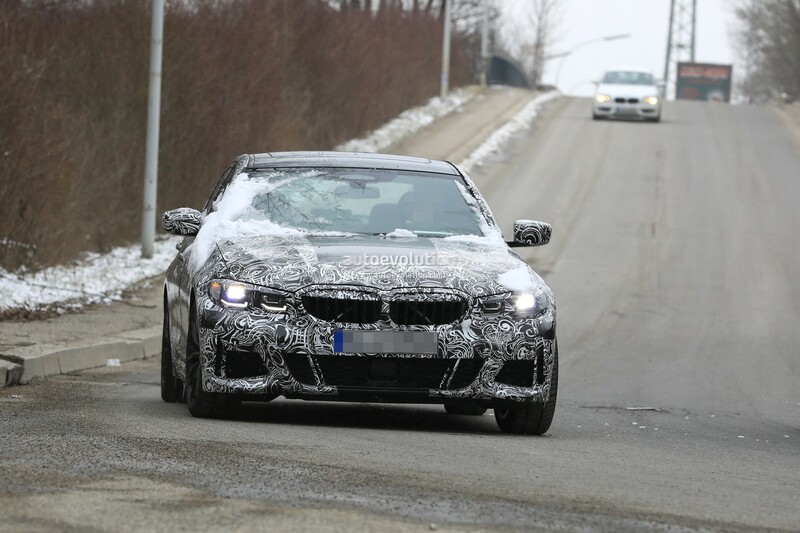 While it might not be necessary to make the M3 all-wheel drive, it’s certainly a possibility that it gets a similar sort of xDrive all-wheel drive system as the M5, only calibrated for the M3. The BMW M5’s xDrive all-wheel drive system, under normal conditions, is a rear-biased, full-time all-wheel drive setup. However, the front axle can be switched off, by the press of a button, so as to put all of the power to just the rear wheels. With all of BMW’s competitors going all-wheel drive, it might be smart to do so itself. 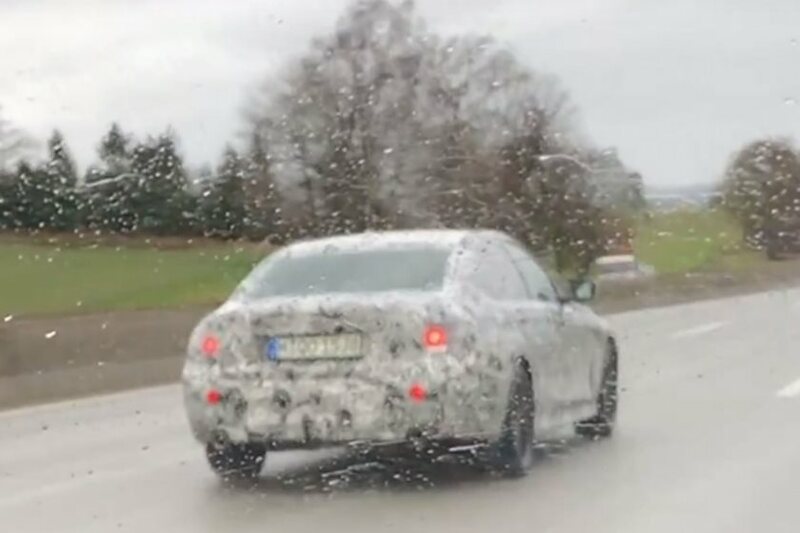 The G20 3-Series is one of the most eagerly anticipated cars set to debut in 2018, and a prototype was spotted by one of our readers in Slovenia just a few days ago. 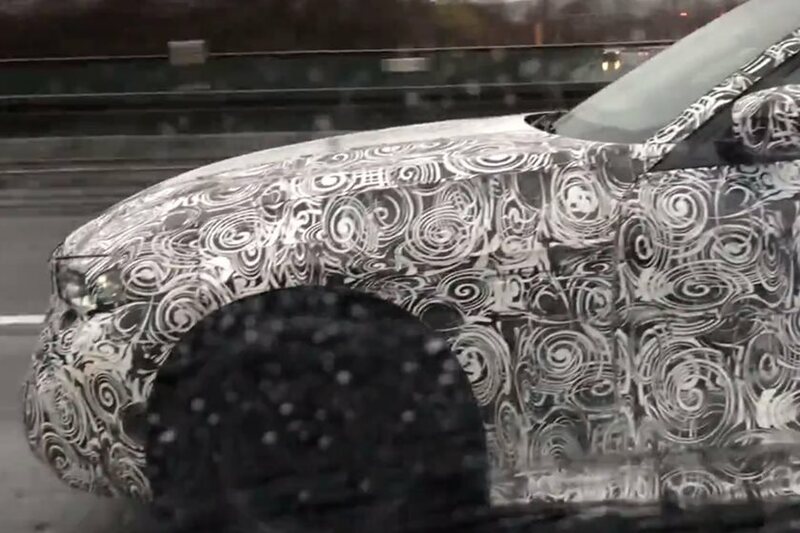 It's well covered up in camo, so we can't make out all the details, but thanks to the light bouncing off the side of the car, we can actually see its creases really well. 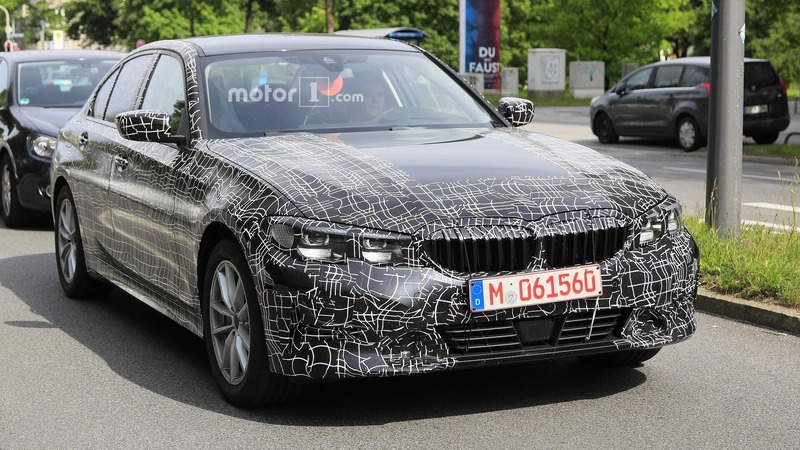 Unsurprisingly, the 2019 BMW 3-Series seems to take after its larger sibling, the 5-Series, and adopt a more dynamic exterior design than the current model. 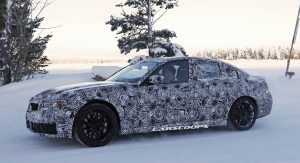 What the car will look like inside is actually less of a mystery, since we have already seen a couple of prototypes with their windows cracked open. Aside from the new digital gauge display, we also noticed a new shifter design, which might be adopted by either all the range or just the iPerformance variant. 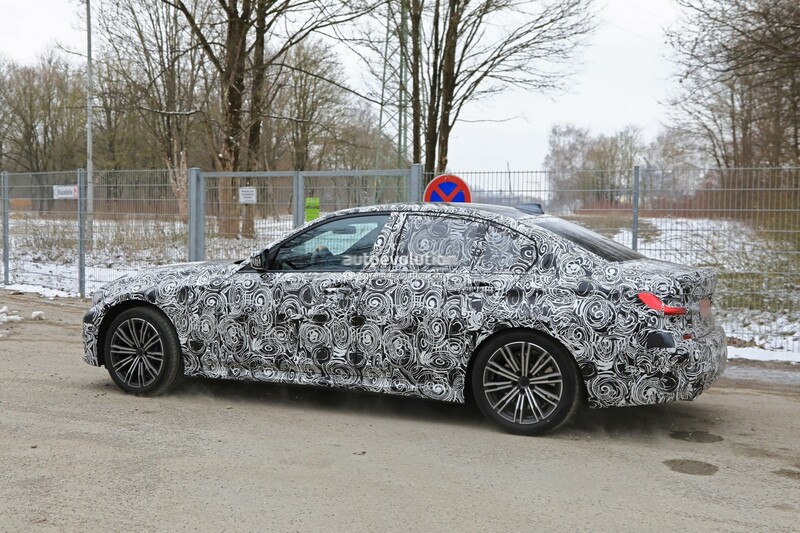 As for what we're going to find underneath the hood of the G20 3-Series, we expect a wide range of petrol and diesel units joined by at least one electrified model. So what about that camouflaged Mini Cabrio thas was following the Bimmer then? 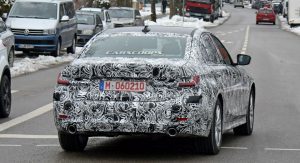 Unfortunately, there isn't much we can tell you about it, though it could be hiding a few facelift-worthy upgrades, especially on the powertrain side, as its 1.5-liter petrol units are expected to get turbochargers with aluminum casings, while cooling systems should improve across the range. There are also rumors that Mini might be working on a dual-clutch transmission, but at this point all we can do is speculate. 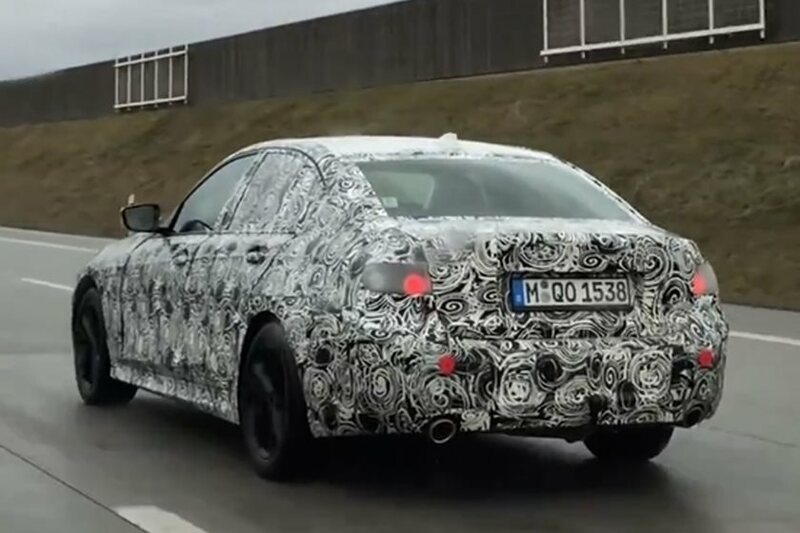 A new BMW 3-Series prototype has now been spotted in public, wearing heavy camouflage, yet having noticeably wider fenders. Gotcha, M3! Our marksman with the lens had very little time to take pictures of the car as it was driving by, but he did notice that aside from the fenders, nothing else looked different at the front. 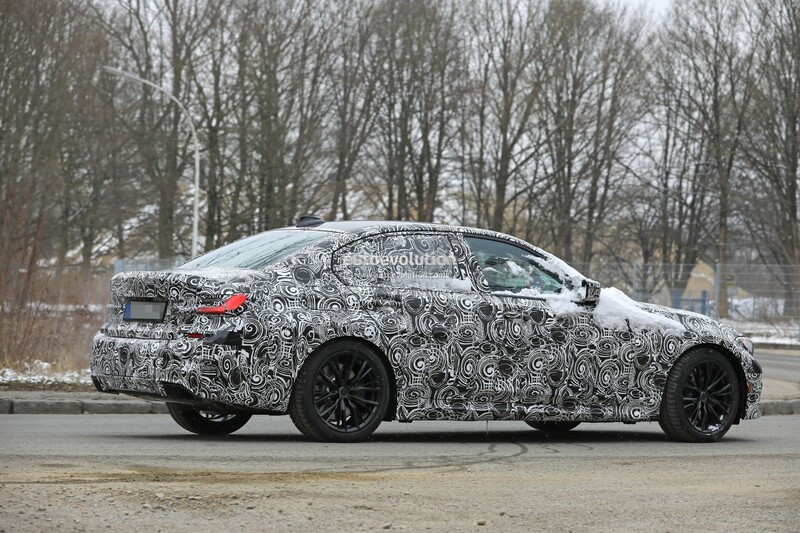 As for the rest of the car, we can see what appear to be M side skirts, a small trunk lid spoiler and a set of quad-exhausts, which is actually what gave the car away - it made more noise than any regular 3-Series prototype seen so far. 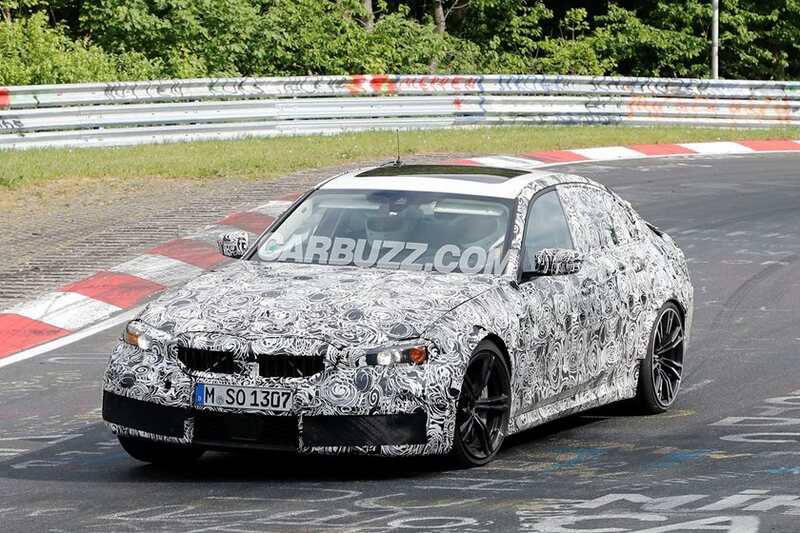 According to sources, the 2020 M3 will be powered by a new twin-turbo 3.0-liter six-cylinder engine, utilizing the same water-injection system as the M4 GTS, sharing the latter's power output of 493 HP (367 kW) and 442 lb-ft (598 Nm). 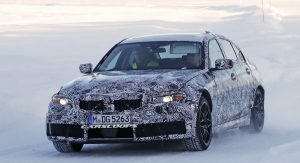 If this turns out to be true, it will make the new car significantly more powerful than the current M3, not to mention lighter and more Eco-friendly, if it does indeed adopt a 48-volt mild hybrid system and electrically spooled turbos. 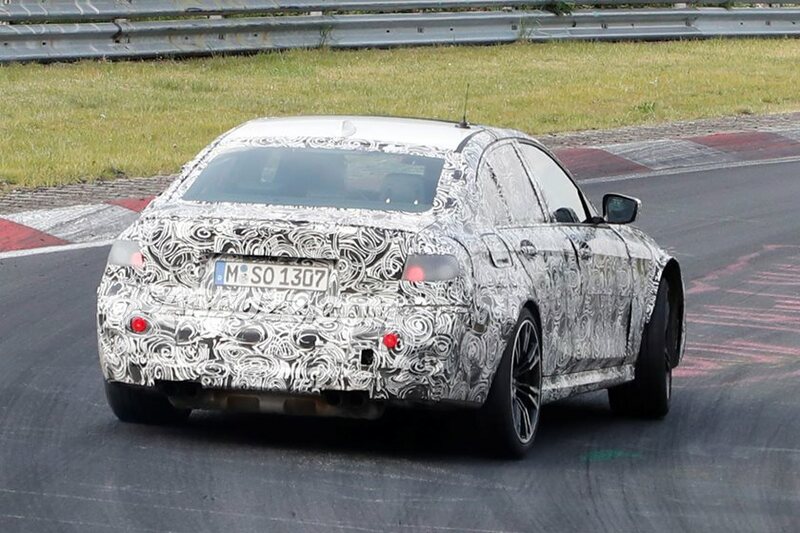 Like its larger sibling, the M5, the all-new M3 is also expected to come with all-wheel drive, although rumor has it this is going to cost buyers extra and that it won't be standard on the car. The system will likely be coupled to an eight-speed automatic gearbox, while the six-speed manual may yet survive the generational shift, if only in rear-wheel drive variants. Grain of salt though. 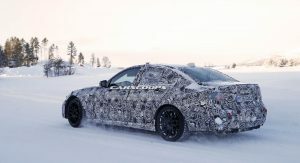 The launch date for the 2020 M3 remains unknown. 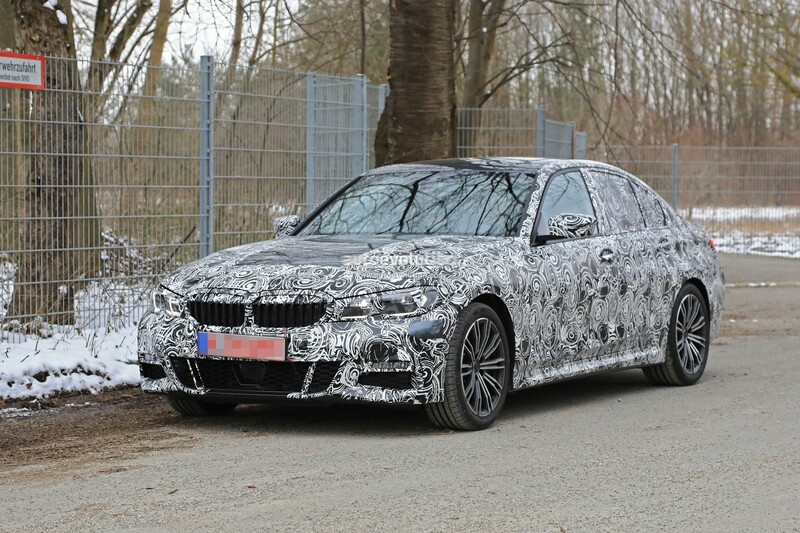 But since the all-new 3-Series will come out to play sometime next year, we could see the M-version make its presence felt either in late 2018 or sometime in 2019, the latter scenario being more probable. SPIED! Hiding In Plain Sight, The Next Gen 3 Series! We keep saying if you keep your eyes open you will eventually catch a great spy shot. 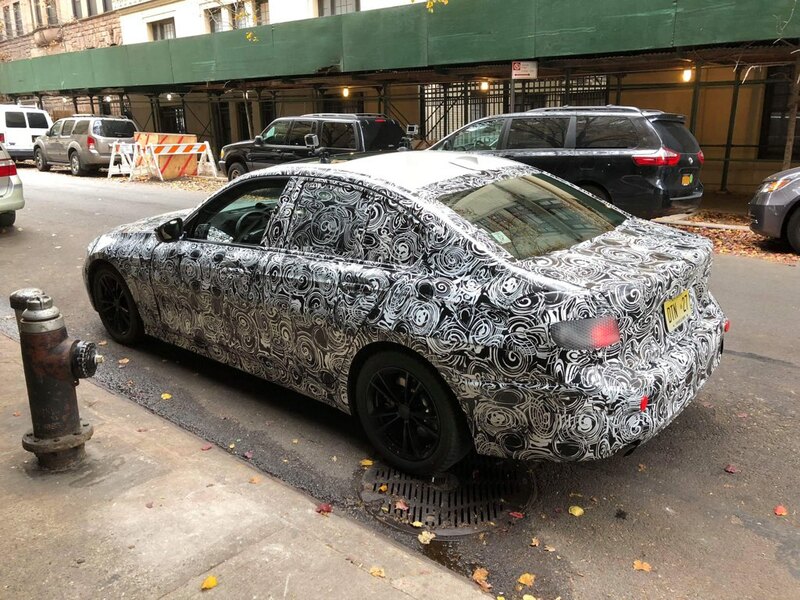 I guess Joe Osso of Fort Lee New Jersey took that to heart, and he came back with these GREAT shots of what appears to be the next gen BMW 3 Series in what looks like to be the New York city area. We absolutely love it when you guys pass these on to us and this gives us a great look before the NAIAS debut in the upcoming days. Thanks Joe for these great shots! And it's expected to debut later this year. Now that BMW has launched the all-new 5 and 7 Series, it’s time for the 3 Series to undergone a complete redesign. 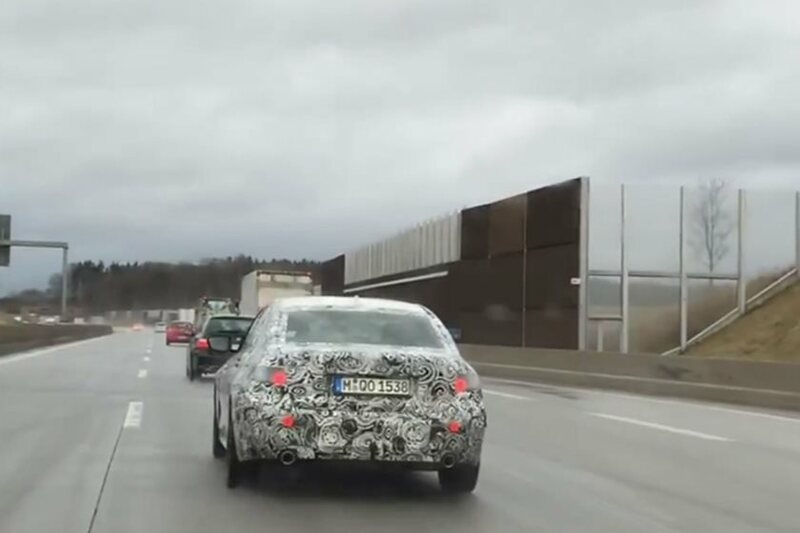 We’ve seen a few spy photos previously, but now Automotive Mike has caught a late stage test mule driving on the Autobahn. If these pre-production cars are ready for public roads, then that means an official reveal is happening very soon, perhaps as early as this March at Geneva. 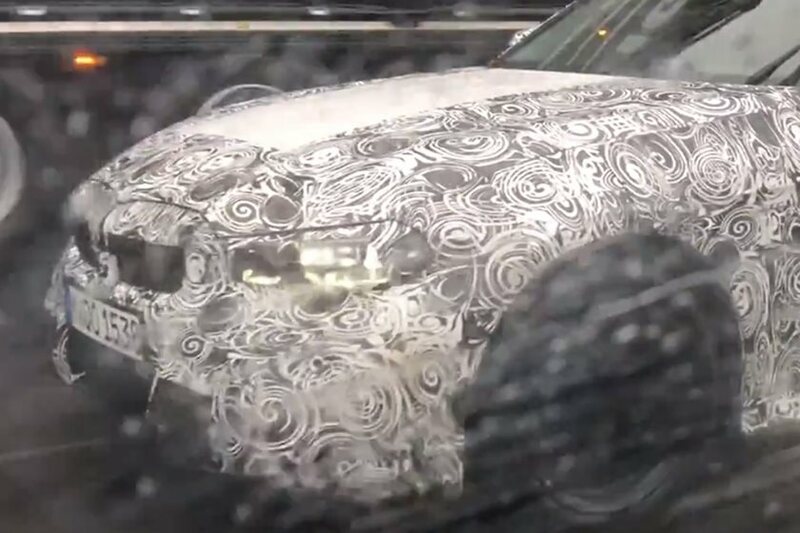 For now, BMW isn’t giving anything away as to when that unveiling will happen, but there’s still a few things to note about the vehicle shown in this spy video. 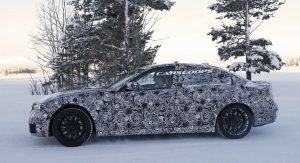 Try to visually strip away the camouflage and you’ll see a sedan that bears many of the design traits found on its two larger siblings, mainly the front headlight styling and various body panel creases. It does look a bit larger than the vehicle it’s replacing, but that makes sense consider the 3, 5 and 7 Series are all now built on the same CLAR architecture. Obviously it can be lengthened and shortened depending on models. As far as what will be under the hood, again, BMW isn’t saying much, but we have some pretty good ideas. Some engine downsizing is expected. The base gasoline engine will likely be 1.5-liter turbo while the base diesel a 1.6-liter three-cylinder. 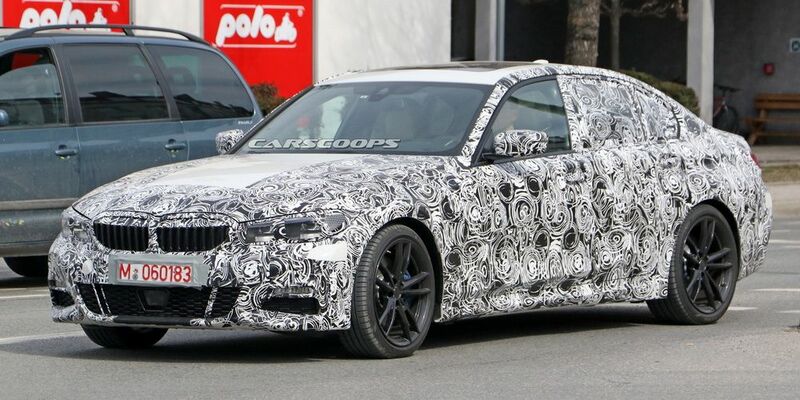 Some turbo fours are also expected and will likely vary depending on markets, but the M340i is expected to feature a turbocharged in line-six. But perhaps the biggest powertrain news is a fully electric variant, due in 2020. It will go head to head with the Tesla Model 3, though previous sources have indicated that this all-electric BMW will be the next-generation 4 Series Gran Coupe and not the 3 Series. Both are built on the same platform like they are currently. A plug-in hybrid 3 Series is also expected for those who want to save money at the pump but aren’t interested in a pure EV. 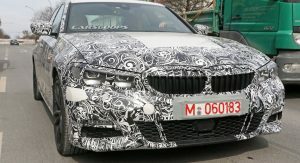 Codenamed G20, the next 3 Series is expected to go on sale as a 2019 model, so an official debut this year is nearly a given. The entire 3 Series range will get more variants. As the BMW 3 Series continues to evolve, so too does the M3 alongside it. 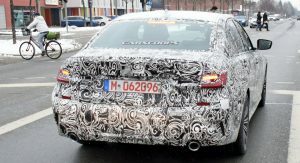 Spy photos have captured both the standard 3 Series and the more potent M3, each with distinctive new design elements that separate them from the outgoing models. Both cars are expected to arrive in 2019, but new details give us an even better idea of what to expect. 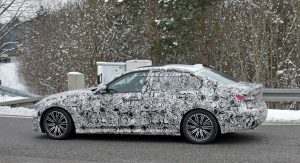 According to Autocar, BMW will add even more variants to the 3 Series range for 2019. 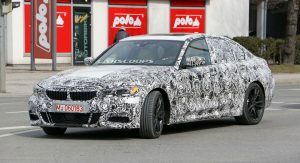 The first variant expected to join the lineup will be the rear-wheel-drive M340i M Performance, which will come with a 360-horsepower (268-kilowatt) twin-scroll turbocharged 3.0-liter inline six-cylinder engine. 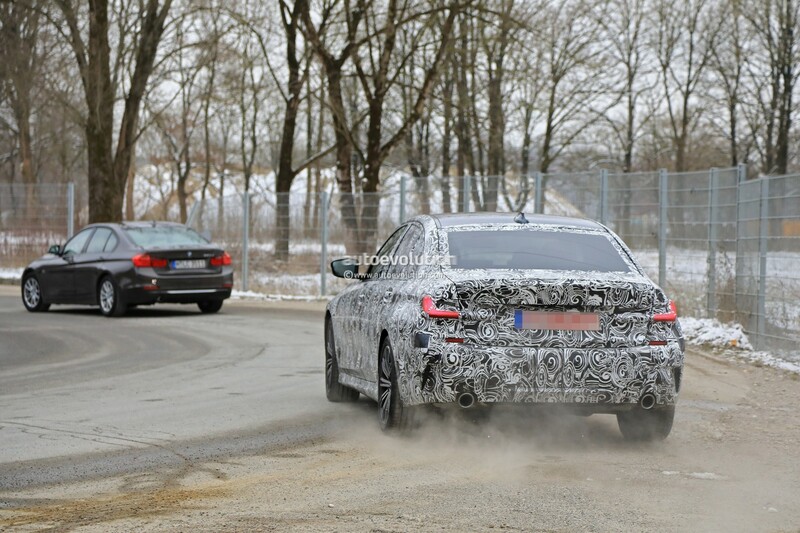 But like the larger 5 Series, gas won’t be only performance engine option available on the 3 Series. 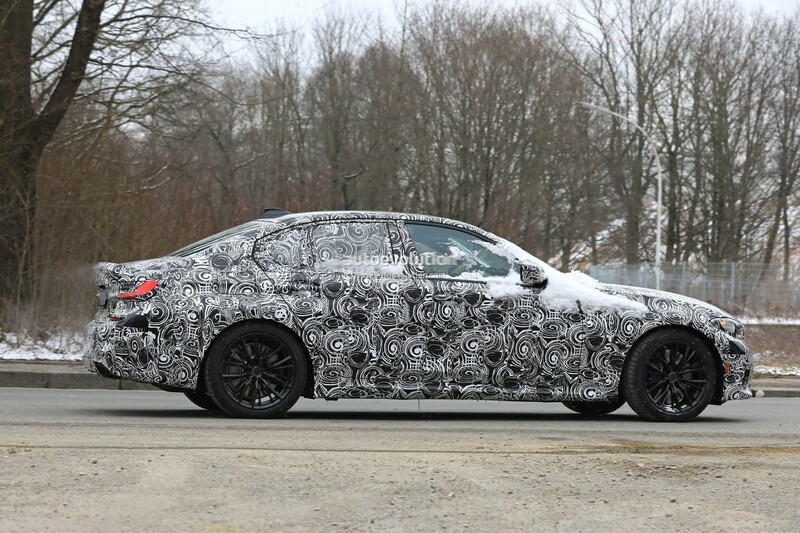 A four-wheel-drive M340d xDrive M Performance model will join the range shortly after the arrival of the M340i. The 3.0-liter biturbo diesel engine should produce somewhere in the neighborhood of 320 hp (238 kW). BMW Chairman Harald Kruger said that diesel will continue to play an important throughout the 3 Series range. "The diesel is a critical component in our efforts to reach the 2020 climate targets," said Kruger. "It is very important in improving the overall efficiency of our future models." If we're lucky, that high-performance diesel engine could even come to the U.S. 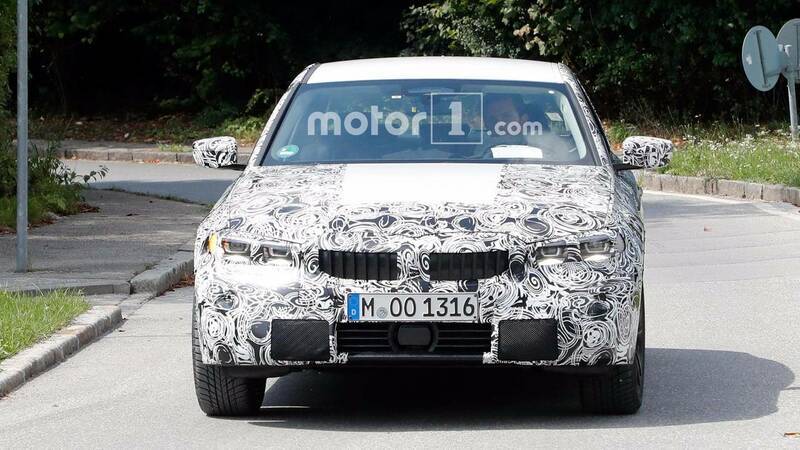 Already the 3 Series and the X3 are expected to share the same 2.0-liter diesel engine with an available 190 hp (140 kW) and 295 pound-feet (400 Newton-meters) of torque. The new diesel 3 Series and the X3 will be sold alongside the upcoming 5 Series diesel for America, the 540d. Design wise, the new 3 Series will borrow a number of cues from the 5 Series before it. It should be lighter, too, shedding approximately 88 pounds (40 kilograms) from the previous model thanks to the extensive use of aluminum and carbon fiber reinforced plastic (CFRP). The 3 Series will make the switch to BMW’s CLAR platform, which currently underpins the 5 Series and the flagship 7 Series. 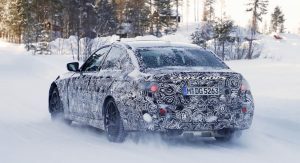 A couple of months ago, our spy photographers caught the first glimpse of the next BMW M3 out testing in the cold and snow. In typical M style, it was moving too fast for us to get a good look at it, but even an M3 has to slow down at some point. And fortunately for us, it did. 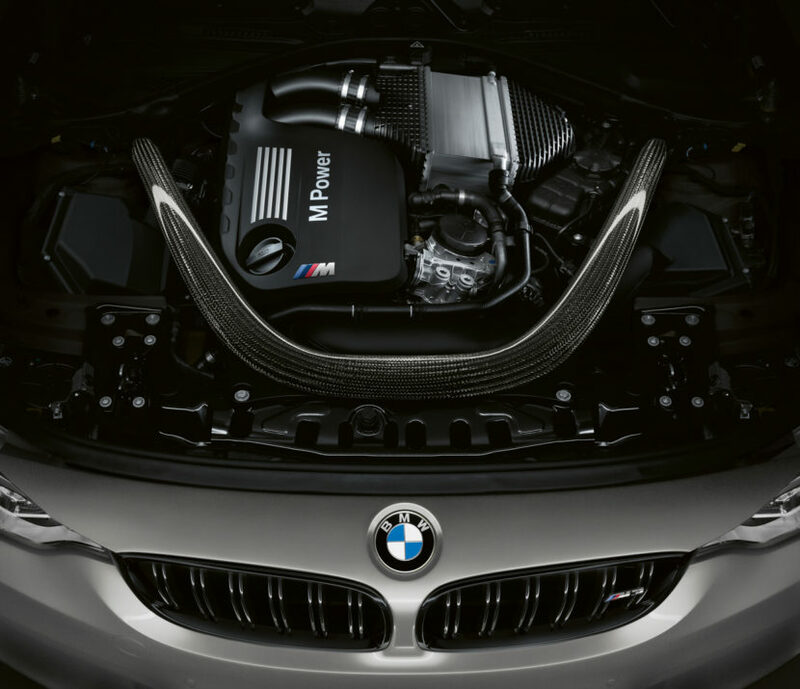 The sixth iteration of the legendary Bavarian performance machine is expected to adopt an upgraded version of the current model’s 3.0-liter twin-turbo inline-six – potentially as potent as the one in the M3 GTS, where it produces 493 horsepower. That innovative water cooling system could feature as well. The jury’s still out on whether that engine will receive any sort of electric assist, but we wouldn’t rule out a (very) mild hybrid setup in the form of a 48-volt electrical system. But if it does feature, we could see other components – like the suspension for example – benefitting from the more robust voltage as well. 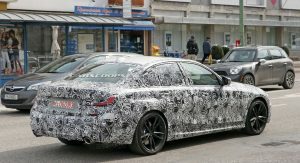 Whatever the oily bits, the performance version of what would be the seventh-generation 3 Series is expected to launch as a 2020 model. So we could see it as soon as the 2019 Frankfurt Motor Show. 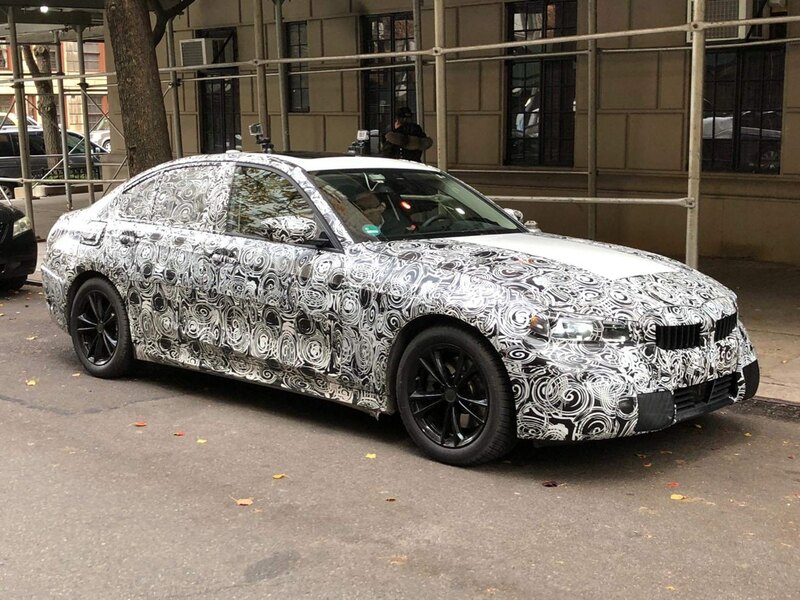 Feast your eyes on the latest spy shots of a prototype for BMW’s next-generation 3-Series, arguably the automaker’s most important model of the decade. It is expected to be revealed in late 2017 or early the following year, as a 2019 model. The platform incorporates lightweight materials such as aluminum, magnesium and, in the case of the 7-Series, carbon fiber-reinforced plastic. 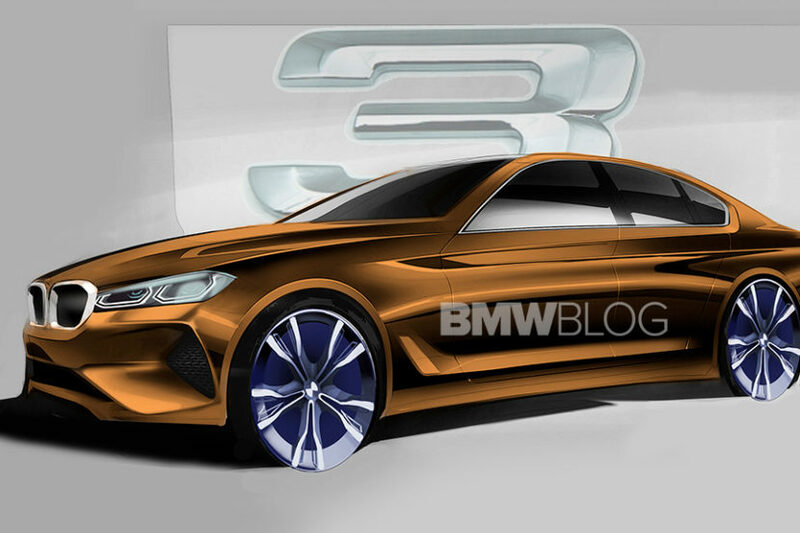 It should bring weight savings of around 88 pounds for the 3-Series. It can also support alternative powertrains including plug-in hybrid and battery-electric applications. Though it’s hard to gauge from the grainy shot of the interior, it looks like there’s a digital instrument cluster. This will likely be teamed with a infotainment system complete with voice activation and gesture control. The driver should also have access to full a suite of electronic driving aids including partial self-driving modes. 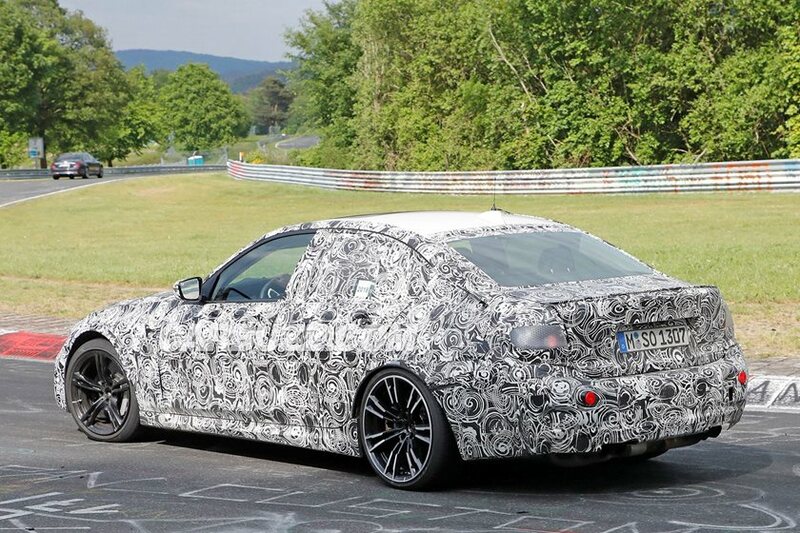 Of course, there will also be a high-performance M3 variant. Don’t be surprised if this one gets some form of electrification to boost performance while reducing fuel consumption. This image has been resized. Click this bar to view the full image. The original image is sized 830x553 and weights 72KB. 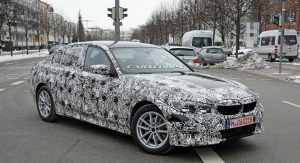 We have already advanced a lot of information about the new generation of the BMW 3 Series, lost weight and much more technologically advanced than its predecessor, distancing themselves from their competitors, but the character of the 3er model is also measured by its engines offering that we will reveal to you today. The new BMW 3 Series – which will be officially on sale in March 2019 – will not come with a revolution in the mechanical plane but rather all the propellers are well known, with some improvements in areas of efficiency and performance, as exhibited by the new 5 Series and X2. This image has been resized. Click this bar to view the full image. The original image is sized 830x467 and weights 58KB. Tthe new 3 Series will continue to use the three-cylinder and 1.5-liter TwinPower Turbo versions that are mounted on front-wheel drive models such as the MINI or the new X2. 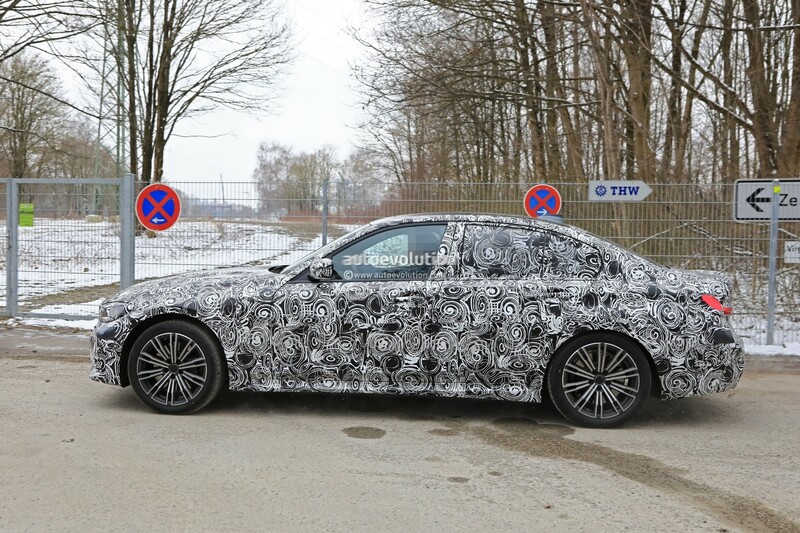 Although many believed that the three 1.5-liter cylinders would be delegated to the front-wheel drive models, the 3 Series will continue to have these powertrains. We can also confirm that all blocks with TwinPower Turbo technology will have technical improvements such as increased pressure of the injection system (350 bar), the turbo blow pressure (up to 2500 bar) and a particulate filter which will be added in the gasoline versions. The diesel will get the SCR catalytic converter and AdBlue tank. The new generation G20 of the 3 Series will offer different mechanical combinations in gasoline, diesel and plug-in hybrids, so that below the “20i” and “20d” will be blocks of three cylinders and up to the “30i” and “30d” four-cylinder blocks will be used. The top range versions, awaiting the arrival of the new generation of the M3, will be the M340i and M340d. Both equipped with a package design from M Performance, the two models will be the only versions of the range that will mount the six cylinders inline block with TwinScroll turbos and 3.0 liters, exclusively with all-wheel drive xDrive, differential M and eight-speed automatic transmission. 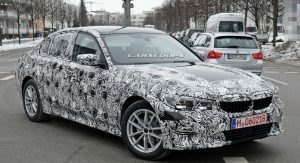 In the case of diesel M340d, the estimated power will be between 320 and 330 HP, while in the case of the gasoline version, it will rise to 380 HP, a bit more than in the new X3 M40i. 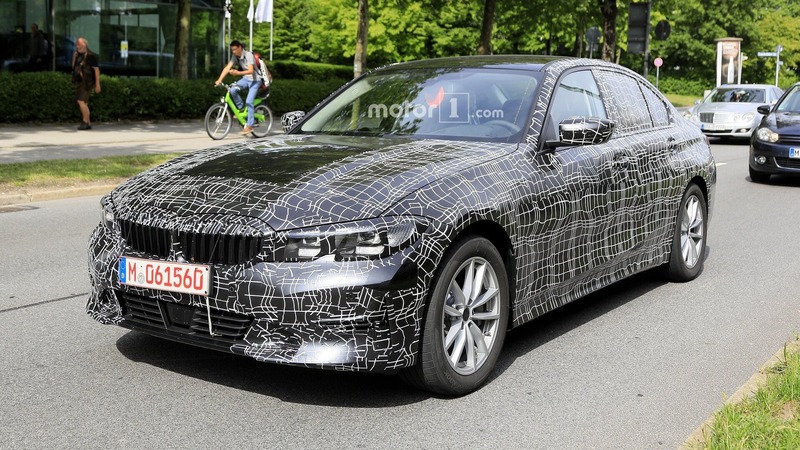 The plug -in hybrid versions will be the 325e and 330e. The 325e version will use the same combination seen in the new MINI Cooper SE Countryman ALL4 and for the second, a four-cylinder block will be used. 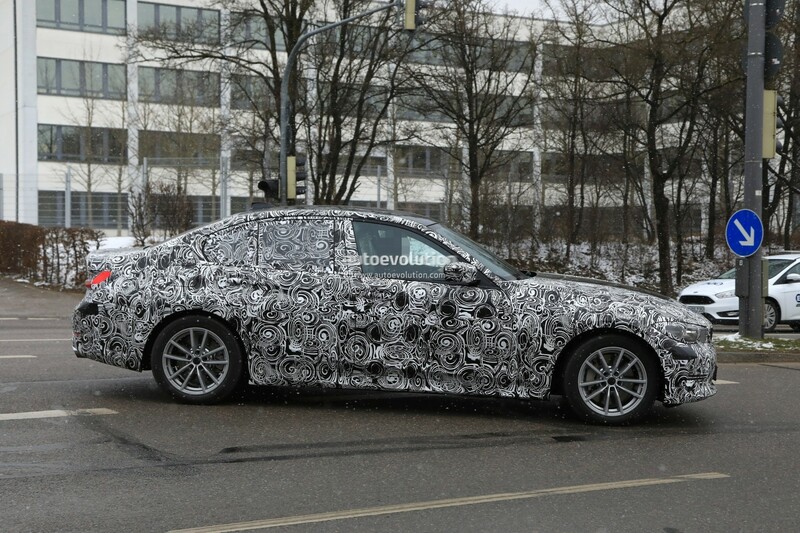 The power figures will be 230 hp in the 325e and 282 hp, approximately, in the 330e. 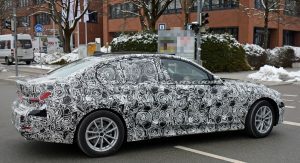 BMW will unveil the new 3 Series in October at the 2018 Paris Motor Show. 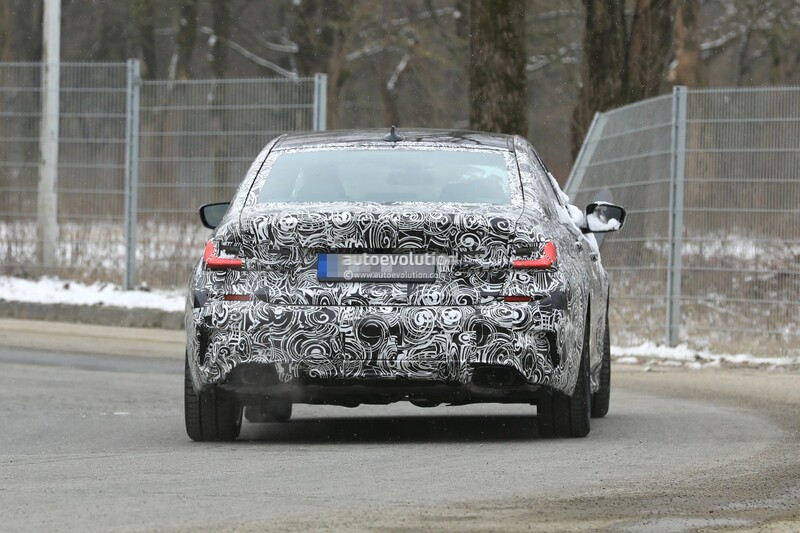 Although the engines are known in the range – all are offered in the range of BMW models currently – as we have said they will have technical improvements in the offer of the new generation of the 3 Series that will mean small increases in power, torque and performance , but the manufacturer will offer a decaffeinated version of the block of the 320d version for the Efficient Dynamics with a maximum power of 170 HP , as you can see in the following table the power figures of the new range, approximate and pending confirmation. 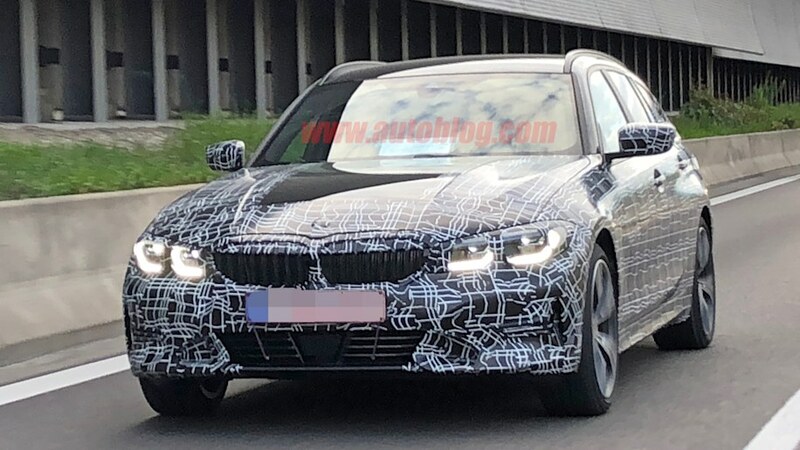 BMW’s upcoming G20 3-Series model will apparently not only feature a front end that’s very reminiscent of the 5-Series, but also a brand new rear end design. 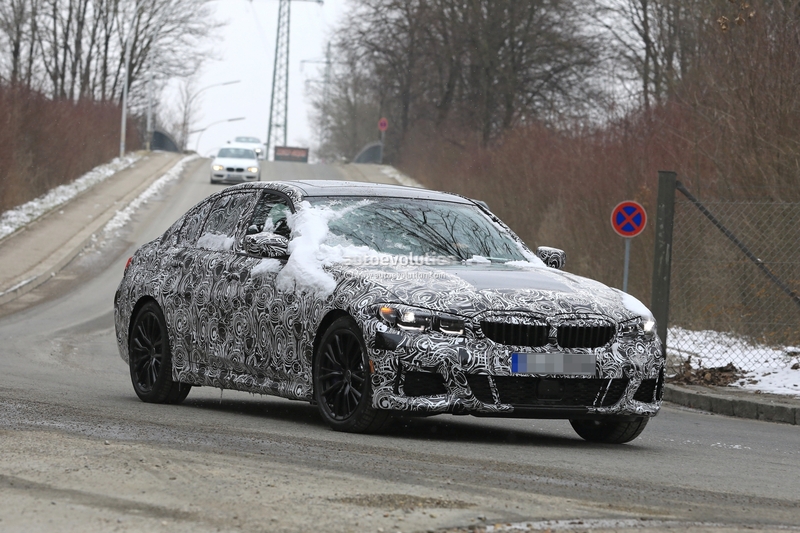 This latest set of images captured by our spy photographers features two different prototypes, one wearing M Sport duds, and another one in a more basic configuration. 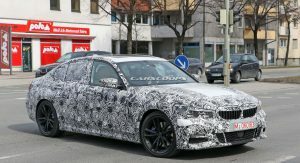 What’s great though is that both prototypes are wearing very thin camouflage, giving us our best ever look at this all-new Bavarian sports sedan. 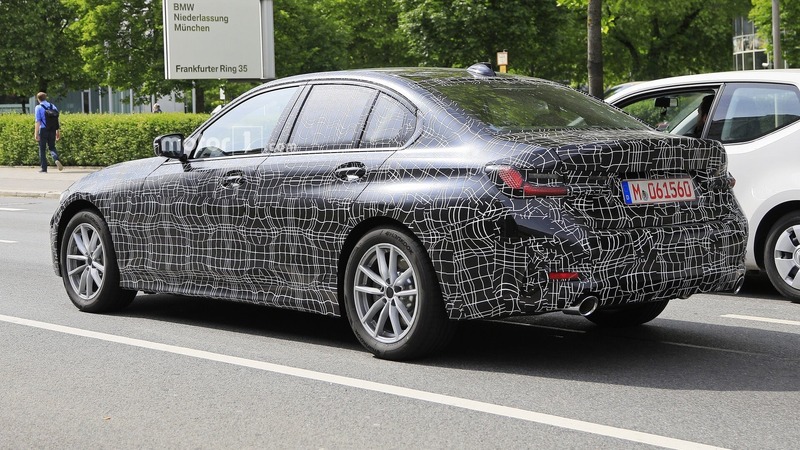 Even though we long suspected that when it comes to styling, the G20 3-Series will take after its larger sibling, the 5-Series, we now know just how similar the two are when viewed from the front. 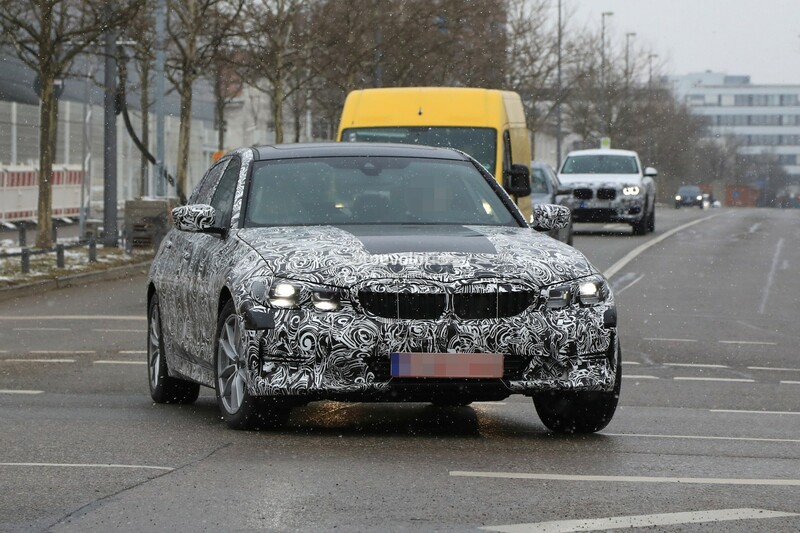 The cut-out of the headlights is easy to spot, and while they’re not exactly identical to the 5-Series’ pair of eyes (a little smaller and straighter in the G20), the grille however does appear to be. As for other noticeable features, there’s a design line that runs across the profile curving upwards, like on the current car, plus two other lines, one cutting across the middle of the doors, and another closer to the door sills. On the current F30 3-Series, the upper-most design line doesn’t go any higher than the rear door handle, whereas on the all-new G20 model, it sweeps over both door handles, which in turn will presumably give the car a more aggressive stance. 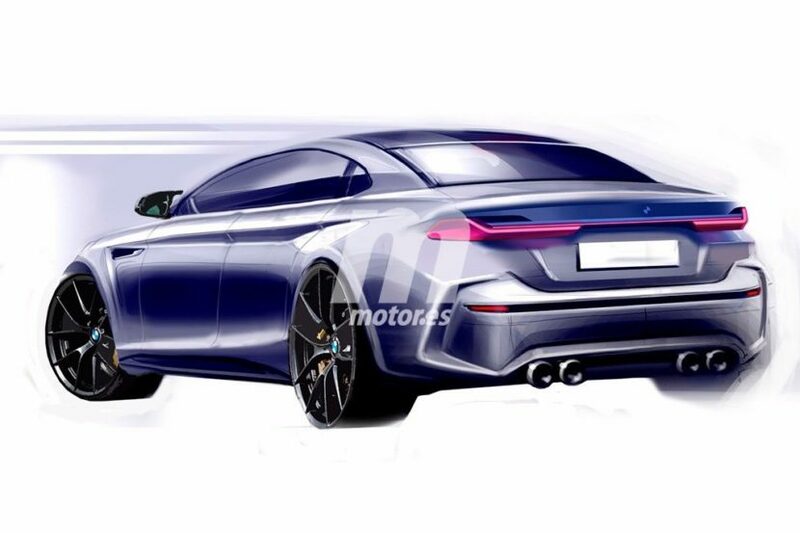 Moving on to the rear, this is where things get really interesting, because we might be looking at a completely new rear end design for a BMW saloon. 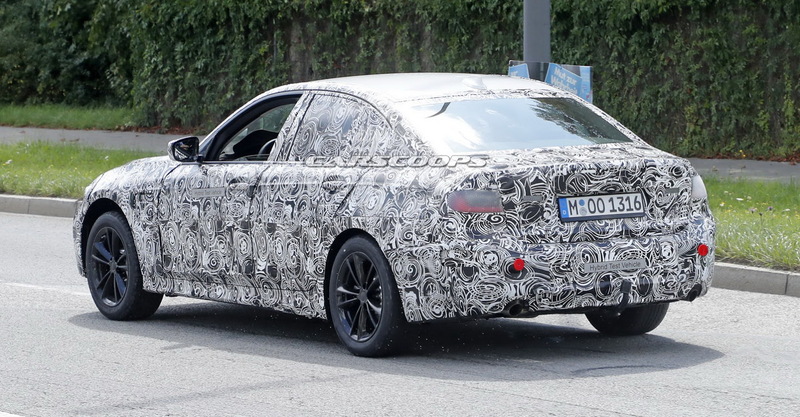 The overall shape of the taillights sort of reminds us of the Audi A4’s, however the bottom part of the cluster also sticks out a little, like on certain BMW concepts and definitely more than on the 7-Series. 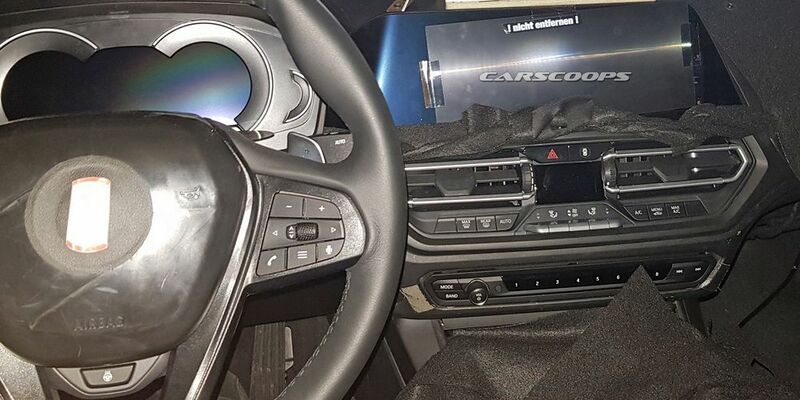 While these images don’t offer us a better look inside, we know that the G20 3-Series will feature a new digital gauge display and a new shifter design. As for power units, expect a wide range of diesel and petrol ones, followed by multiple electrified powertrains. 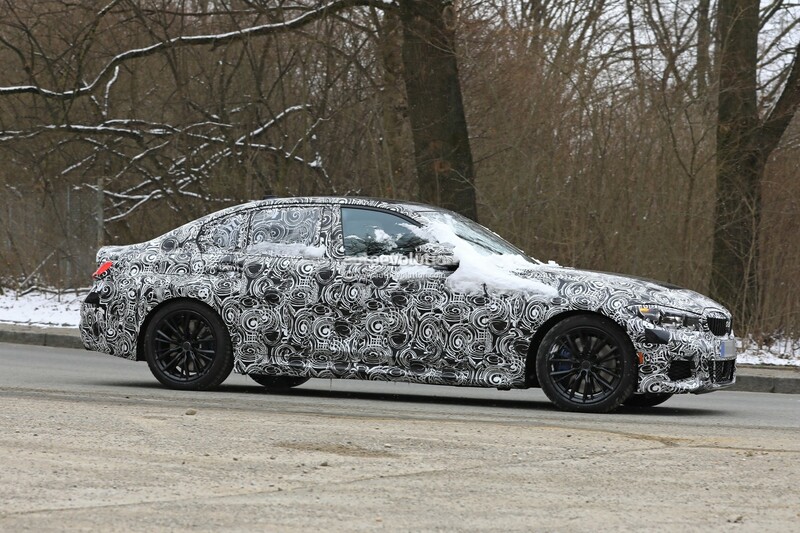 The all-new 2019 BMW 3-Series is on track to make its official debut sometime later this year. With stiff competition from Audi, Mercedes-Benz and Jaguar, BMW’s current 3-Series has done fairly well for the Munich-based manufacturer. However, their bread and butter model is getting rather long in the tooth and time for a replacement is nigh. So how will BMW keep buyers flocking to its best-seller? Well let’s take an illustrative preview of the all-new G20 3-Series. At first glance the look isn’t a radical departure. Its overall styling is similar to that of the larger 5-Series, with the details making the difference. Starting at the front, BMW’s twin-kidney grille has more depth, with a rearward ledge that follows the same rake of the hood. Headlights are defined by small indentions along the lower edge and intersect the grille – yes, you guessed it, like the 5-Series. Gazing upon the side reveals a deeply-sculptured channel along the lower doors, subtly curving upwards towards the rear. Front fenders carry a diagonal crease like that found on the Z4 roadster, whilst the Hofmeister kink has an angled cut with chrome trim on the c-pillar. There’s a double-crease near the taillights, whilst the rear bumper is defined by dual exhausts and vertical bumper cut-outs. The new 3-Series will ride upon the BMW brand’s flexible CLAR platform, which underpins other models like the X3, 5-Series and 7-Series. 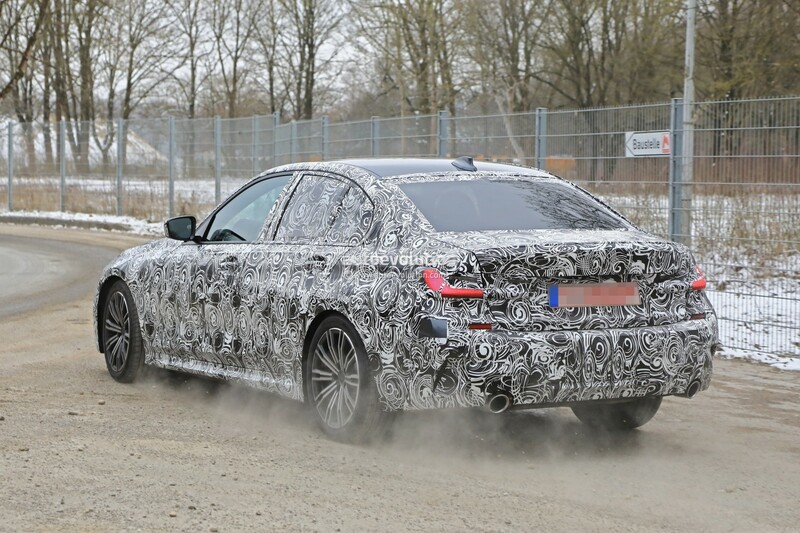 This means the 3-Series will be offered with traditional rear wheeled propulsion or an xDrive all-wheel-drive system. Expect to see a modest reduction in weight along with better interior packaging for increased occupant space and comfort. 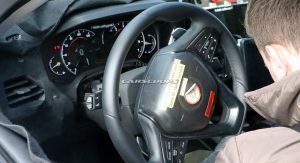 Cabin styling has largely been kept under wraps to date, however prototype mules have shown a new digital gauge cluster and shifter styling. Like the current car, the G20 3-Series will offer a range of gasoline and diesel engines. These include a TwinPower 2.0-litre turbocharged four-cylinder, with upwards of 250 hp. Those looking for more horses will have the option of a 3.0-litre, turbocharged six pumping out close to 360hp in the 340i M Performance gasoline model and an all-wheel-drive diesel variant producing around 315 horses. Conjecture has it that we’ll also see xDrive hybrid versions in two states of tune, ranging from 230hp to 265hp. 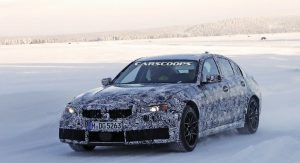 Topping the range will be an M3 version, which for the first time, will be available with all-wheel drive. It will continue to be powered by a turbocharged-six, but could gain BMW’s water-injection system that was first introduced on the BMW M4 GTS, producing close to 500 horsepower. Arguably one of the toughest segments to compete in, the new 3-Series will battle against some luxury heavy-hitters like the Mercedes-Benz C-Class and Audi A4. Lower down the pecking order, you can include Jaguar’s XE, Lexus IS, Infiniti Q50, Genesis G70 and possibly even the Kia Stinger amongst those also vying for 3-Series customers. 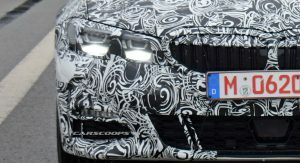 As for an official launch, we expect to see BMW reveal it later this year, possibly at the Paris Motor Show in October. 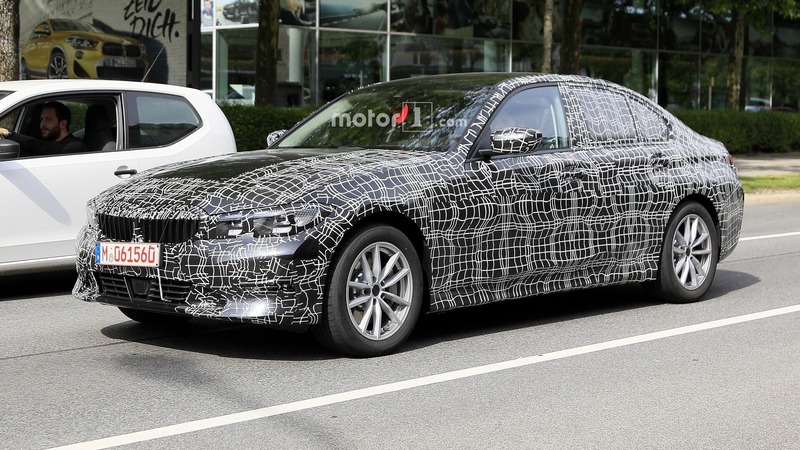 Has BMW played it too safe with the all-new 3 Series? Tell us in the comments below. BMW is currently in the midst of a transformation process that sees the company behind determined to fill more niches than ever and switching to a front-wheel-drive-based platform for multiple models, next-gen 1 Series included. 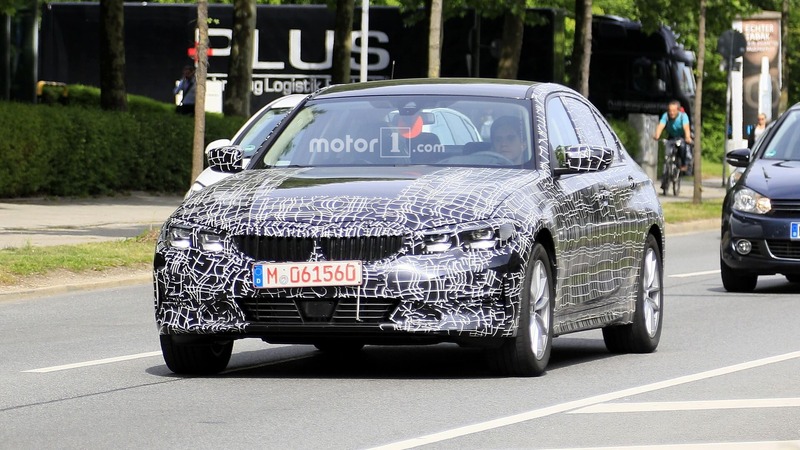 However, the 3 Series remains one of the main pillars of the Baravian automaker and we can now zoom in on the production design of the 2019 3er. 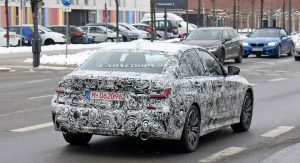 Note that the spy shots above, which have been snapped earlier this week, include three prototypes and it seems that the car packing the trapezoidal exhaust pipe ornaments could pack the M Sport attire. 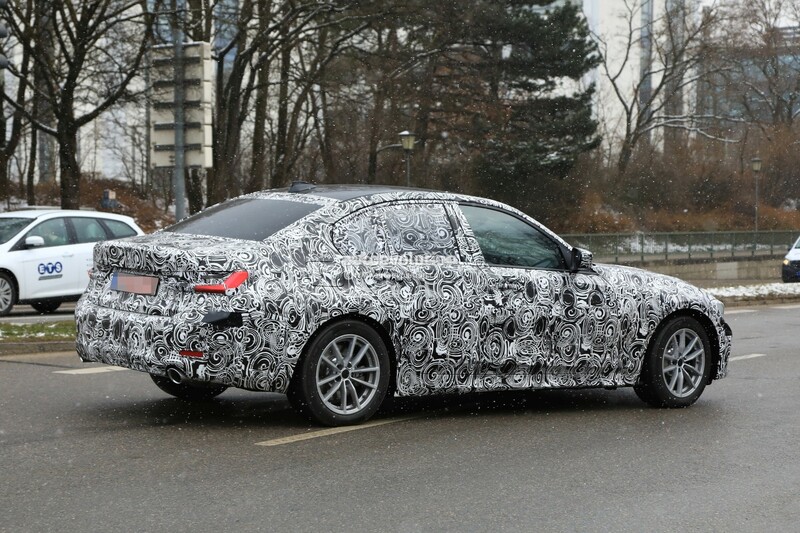 While the matryoshka doll design theme continues, which means we're dealing with a baby 5 Series appearance, the upcoming G20 3 Series shows sportier details, such as the air-hungry intakes found in the front apron. 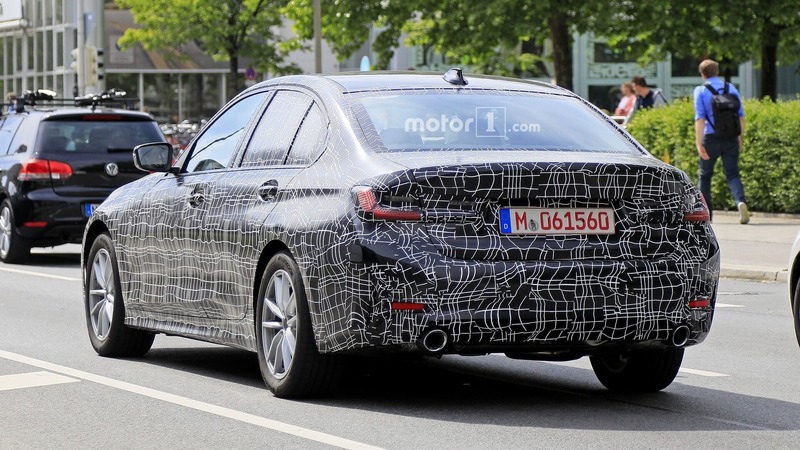 The all-LED production lights of the 2019 3 Series are also visible, even though the headlights are less camouflaged than the taillights - expect the styling direction showcased by the rear light cluster to show up on other future BMW models. Speaking of the 3 Series' big brothers, the newcomer will mark the model's switch to the CLAR platform. 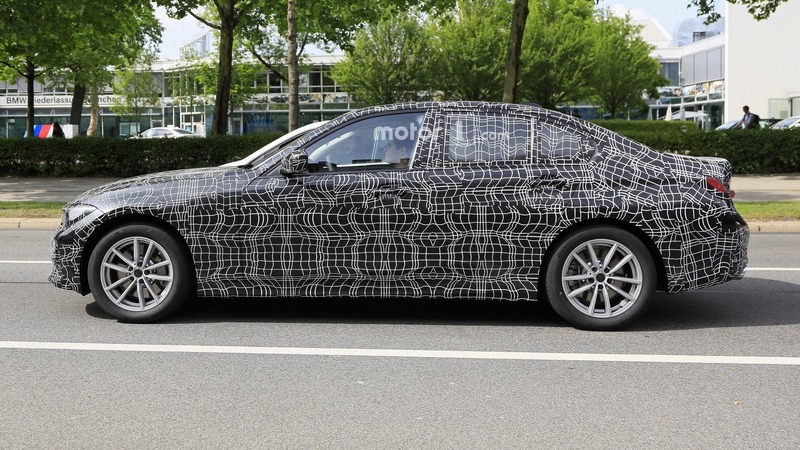 The modular architecture has already proven itself under the skin of the 7 and 5 Series. The engine range of the newcomer will be more complex than ever. At the bottom of the range, we'll find the 318i, a three-cylinder model with 150 hp. Entering turbo-four land, we can talk about the 204 hp 320i, whose Efficient Dynamics version will deliver 170 hp. There will also be a sportier four-cylinder option, namely the 265 hp 330i. 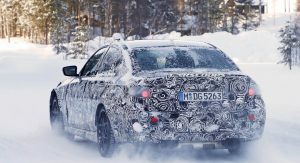 At the top of the gas range, we'll find the 2019 BMW M340i, which should offer around 380 hp. Diesel buyers will be treated with the 316d (136 hp), 325d (238 hp) and the 330d (265 hp) - we're not sure about the details of the 318d and 320d, though. 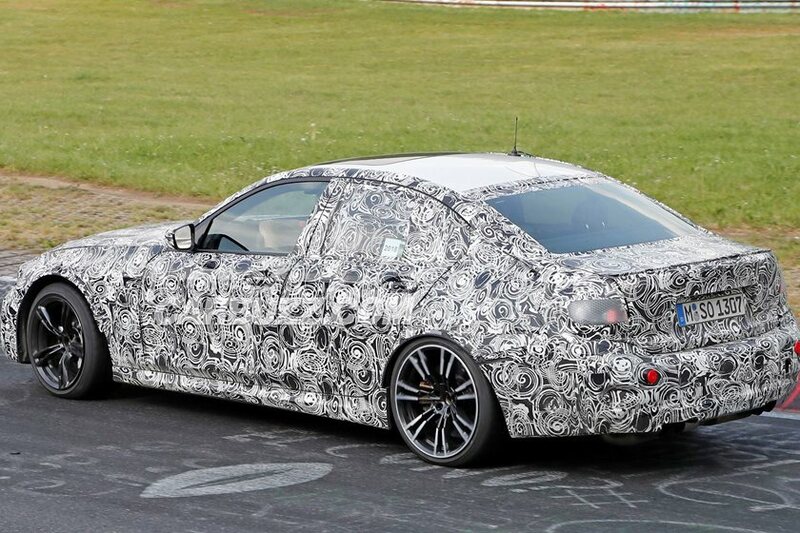 There will also be an oil-burning M Performance car, with the M340d expected to offer at least 320 hp. 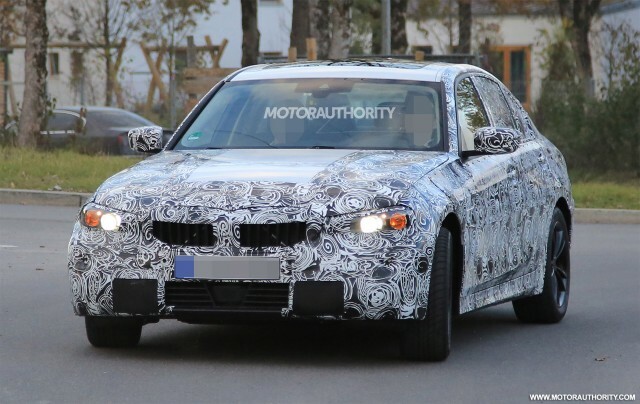 The next-generation BMW M3 has also been spied. 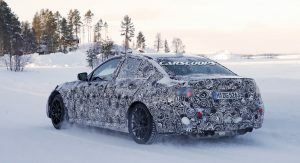 The G80 M3 will leave the current car's twin-turbo 3.0-liter straight-six behind, welcoming an S58 motor featuring a similar configuration. 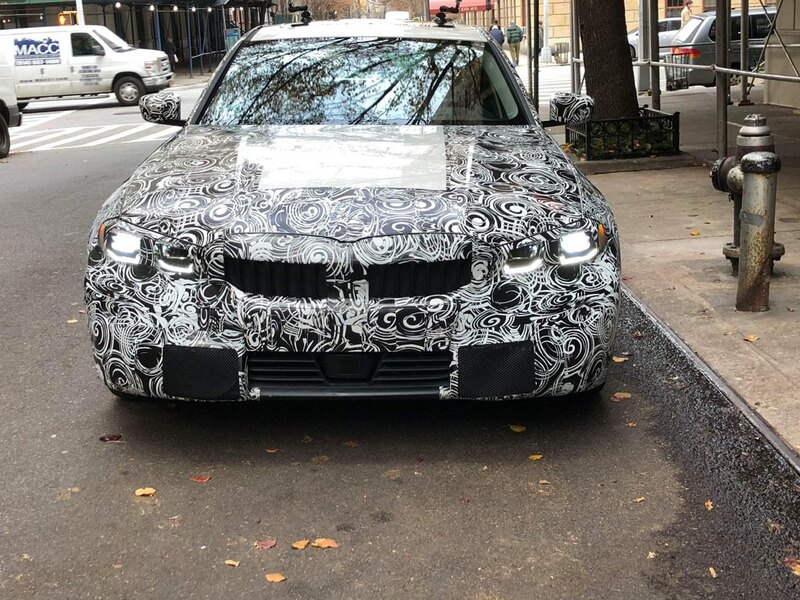 The new unit, which should deliver at least 460 hp, will make its debut on the upcoming BMW X3 M. And the M xDrive all-paw rumors surrounding the M3 are strong. As for the new energy side of the lineup, we'll get a pair of plug-in hybrids: the 230 hp 325e iPerformance and the 265 hp 330e iPerformance, with both coming in xDrive form. And since the German automotive producer is preparing the iX3 electric crossover, the powertrain used for the high-riding model could be used for an EV incarnation of the new 3 Series. 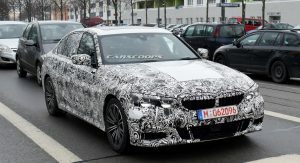 The 2019 incarnation of the BMW 3 Series is set to land in October, at the Paris Motor Show, with the first deliveries expected for March 2019. However, with leaks being more frequent than ever these days, we might get to meet the naked G20 3er before the fall. 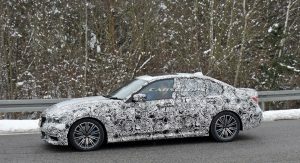 The 2019 BMW 3 Series, codenamed G20, will be the seventh generation of the Munich carmaker's volume seller and multiple award winner. The sedan we'll supposedly see at this year's Paris Motor Show will be almost all new, from platform to interior materials. Engines will carry over, but they get a host of updates resulting in more power and lower emissions. And two new M Performance additions to the range, the M340i and M340d, will supplant the current 340i and fill the gap between the standard models and the M3. We've pieced most of the following reporting together from a new Autocar story and information gathered by BMW Blog over the past few months. 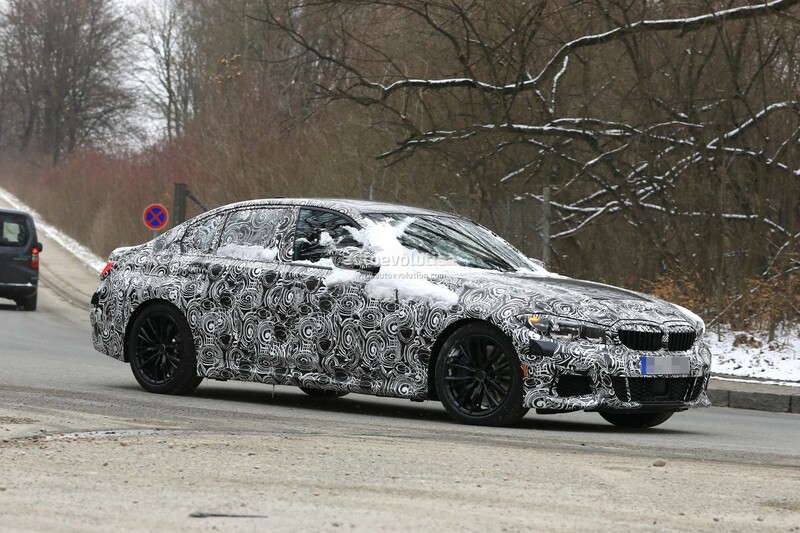 Spy shots have clued us in to a new 3 that will shrink the formulas used by the 5 Series and 7 Series, and get a much better interior. With the move to the CLAR architecture, Autocar reports that overall length grows by about 2.4 inches, the wheelbase stretched by 0.8 inch, width also fractionally larger. The length and wheelbase remain a touch shorter than those of the Mercedes-Benz C-Class. Additional magnesium and high-strength steel are expected to lower weight by roughly 88 pounds, and a new chassis layout confers a 49/51 front/rear balance. Sleeker headlight clusters hook up with a wider kidney grille and house squarer angel eyes. A camera sits between the grille and a radar unit below, the kidneys hiding active shutters to promote fuel economy. New bumpers sit front and rear, connected by character lines along the flanks, plus a new rear diffuser and an integrated decklid spoiler. We hear designers aimed to enhance the "sportiness and visual appeal" of the nameplate that's given up some ground to seriously sporty rivals. At the same time, the G20 is the first 3 Series model to get the ultimate wind tunnel treatment. Autocar says the most aerodynamic body registers a 0.22 coefficient of drag. The performance case gets new help from two M Performance versions mimicking revisions in the 5 Series line. The M340i is said to send 380 horsepower and 369 pound-feet of torque to all four wheels, according to BMW Blog. 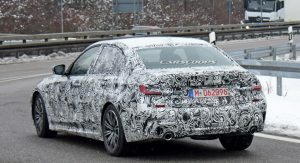 Autocar believes the M340i will get 360 hp and rear-wheel drive, but the other recent M Performance offerings are all-wheel drive, as are the Mercedes-AMG C43 4Matic and Audi S4 quattro rivals. Telling the hotter sedan from its siblings will be easy with upgraded bits like silver side mirrors, better brakes and blue calipers, and exclusive alloys. BMW Blog notes that Portiamao Blue and Blue Ridge Mountain extend the color palette. An M-tuned suspension, M differential and variable steering will address dynamics. After seeing a 3 Series prototype with a taped-off roof, BMW Blogwonders if a carbon roof will join the options list. The M440d xDrive uses a diesel 3.0-liter inline-six getting 320 hp and "tons of torque." You can forget about manual transmissions in all but the 320i and lower trim models. Overall, the gas engine lineup will get horsepower bumps of between 15 and 20 hp, but will emit 5 percent less CO2 courtesy of changes like a tweaked belt system, more efficient cooling, and particulate filters. Diesels will run more pressure in their common-rail injection systems, two-stage turbocharging, selective catalytic reduction filters, and AdBlue tanks. The plug-in hybrid 325e gets bumped to 230 hp, the 330e rises to 282 hp. This seventh-gen sedan might also welcome the long-rumored all-electric model. 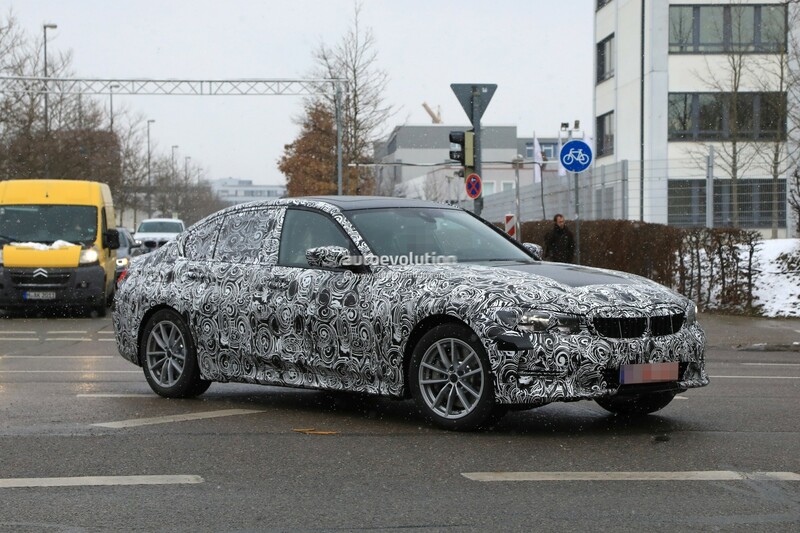 BMW should bring the standard 3 Series to Paris, the retail launch to happen around March 2019. The M Performance versions could follow up to a year after that. Rumored to pack close to 500 horsepower underneath that camouflaged hood. While BMW is putting the finishing touches on the first-ever fully fledged M versions of the X3 and X4 crossovers, it’s also perfecting the next iteration of its legendary M3. 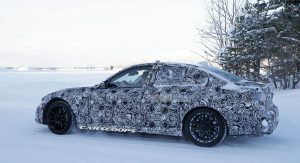 Originally launched in 1986 for the E30 model, the high-performance sedan is getting ready to embrace a new generation likely scheduled to come out at some point in 2020. 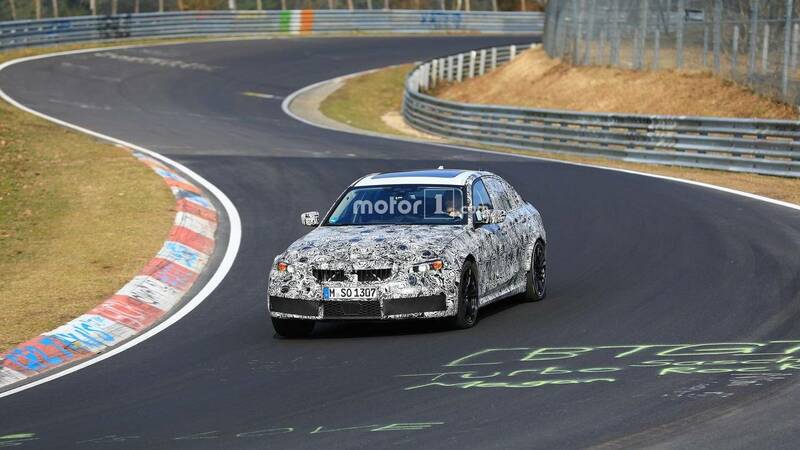 Another prototype of the speedy sedan (codenamed “G80”) was seen this week tackling the challenging Nürburgring, riding low and carrying extra layers of swirly camouflage to conceal what must have been the production body. 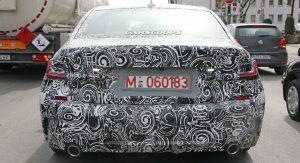 The test vehicle seemed to feature the provisional headlights and taillights, which is usually a sign that it will take a while until the production-ready model will come out. Despite the extensive disguise, we can see the proportions will remain just about the same, although it may turn out to be a tad wider and the wheelbase could be slightly extended to free up leg room for rear passengers. The back of the car is hiding a subtle trunk lid spoiler, and by the looks of it, the car did not have the final exhaust system. 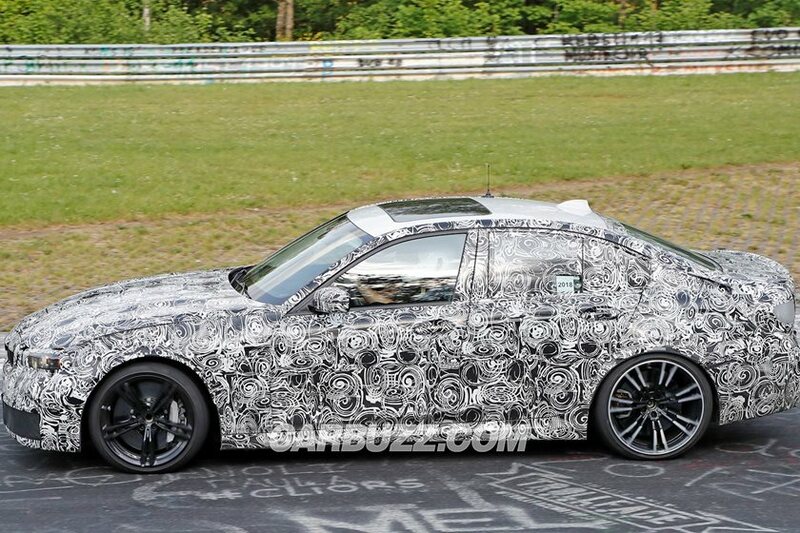 Latest intel suggests the turbocharged 3.0-liter inline-six engine will be tuned to deliver close to 500 horsepower channeled as usual to the rear wheels, but rumor has it the M3 will also be offered with an optional xDrive. The RWD model is expected to be lighter than today’s model after switching to the CLAR platform already underpinning several new BMWs. 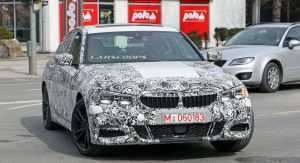 The M3 sedan will be joined once again by its two-door M4 Coupe and Convertible siblings and all three are said to share a 48-volt mild hybrid system. We’ve heard through the grapevine that the M4 GTS’ water-injection system could trickle down to the regular M3/M4, though we’ll have to wait and see about that. Like the Audi SQ7 and the equivalent Bentley Bentayga Diesel, the M trio could also boast electrically spooled turbochargers for instant response as a way to virtually eliminate the dreaded turbo lag. 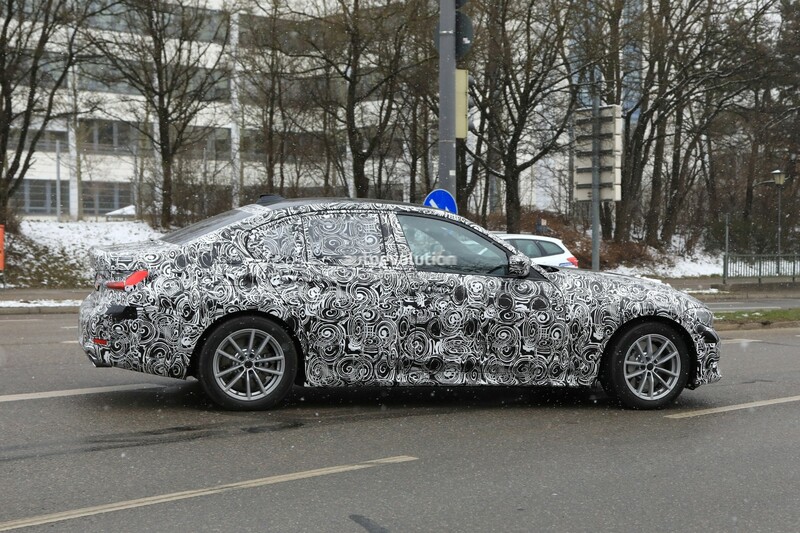 But before the next M3 arrives, this fall we will reportedly get to see the regular 3 Series (G20). It will be joined in 2019 by the more practical wagon (G21) and in 2020 by the refreshed 4 Series Coupe (G22) & Convertible (G23). 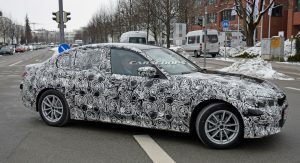 BMW’s upcoming G20 3-Series model will apparently not only feature a front end that’s very reminiscent of the 5-Series, but also a brand new rear end design and a high-tech interior. 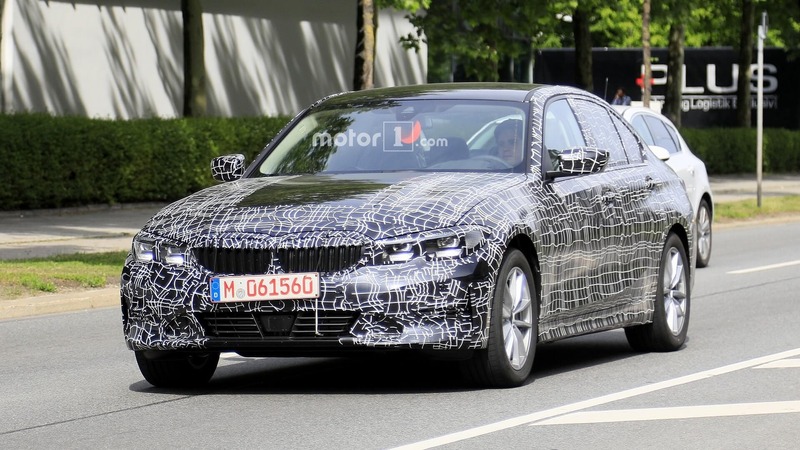 The all-new BMW 3-Series might take after its larger sibling when it comes to exterior styling, however inside, thanks to this latest batch of spy images, we can tell you that the dashboard and center console design is a little bit different. There’s a new digital gauge display, which we already knew about, plus a new shifter design, considerably smaller than what we’re used to seeing in other BMW models. 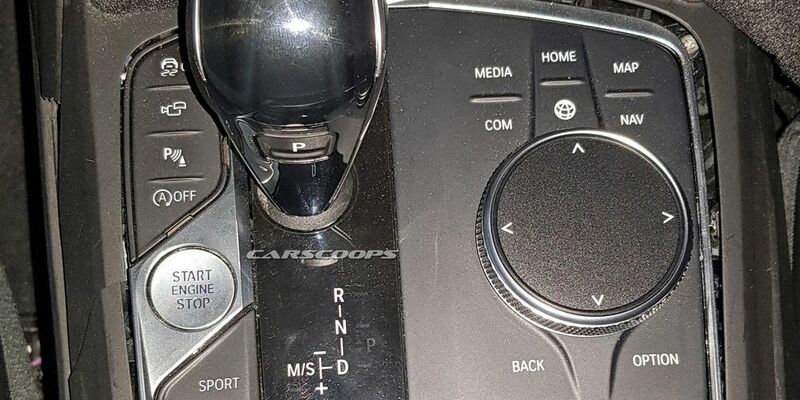 It’s actually the same knob found inside the new 8-Series Coupe and the new X7, both of which feature the exact same center console design as the G20 3-Series, a design first seen on the 8-Series Concept. 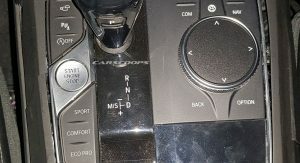 To summarize, the swivel wheel controls the infotainment system, then we see buttons for the start/stop engine function, parking sensors, video camera, three driving modes (Sport, Comfort, Eco Pro) and more. 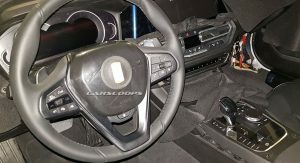 Move north of the center console and you’ll find the stereo, while above that there’s the climate control system, followed by a pair of air vents. On the 5-Series, the stereo is the one between the vents and the climate control. BMW’s Operating System 7.0 is coming to the all-new 3-Series, boasting a new layout with more intuitive commands. Users will also benefit from more customization options as well as intuitive modes of operations, such as its ability to switch to a parking map as you’re approaching your destination. The user will operate the system via either the iDrive swivel wheel, via touchscreen, voice or gesture control. 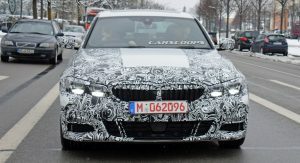 Further images captured by our spy photographers feature two different prototypes, one wearing M Sport duds, and another one in a more basic configuration. 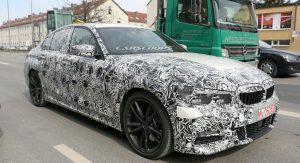 What’s great though is that both prototypes are wearing very thin camouflage, giving us our best ever look at this all-new Bavarian sports sedan. Entry-level 3-Series models should continue to utilize 3-cylinder engines, although probably not in North America where the current car is only being sold with four and six-cylinder units. 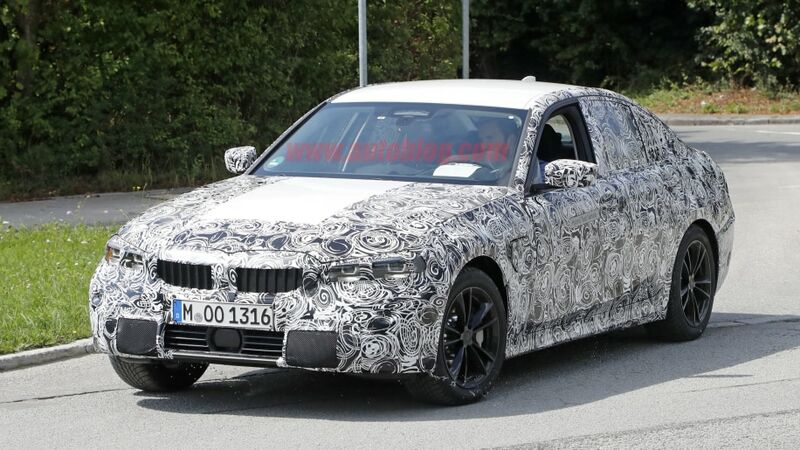 The 3-cylinder engines in question (diesel and petrol) will likely be the BMW Group’s 1.5-liter ones, which we expect to find on 316i and 316d versions of the new 3-Series. Mostly though, it’s going to be 2.0-liter and 3.0-liter units, with four, respectively six cylinders. Also, word has it at least two plug-in hybrid versions will join the range, using electrified 1.5-liter and 2.0-liter engines. 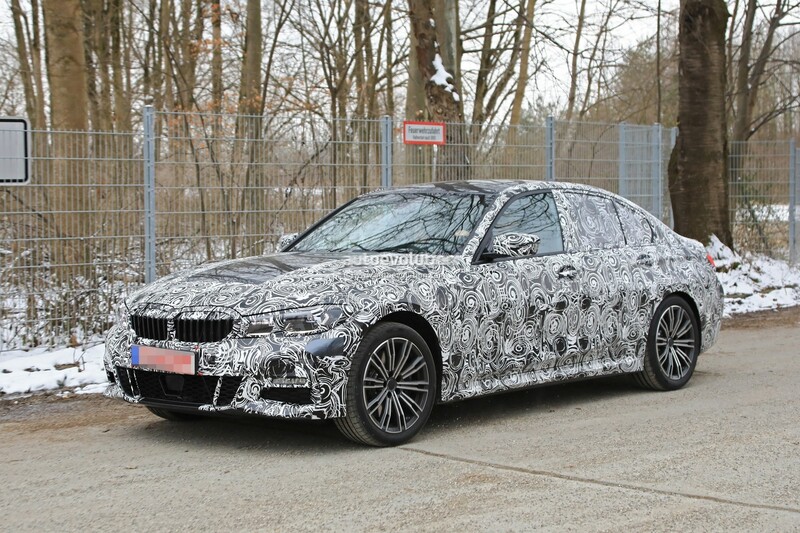 The tip of the spear for the upcoming 3-Series range will wear the M Division’s logo, in one way or another. 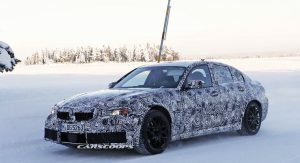 To start with, there will be an M340i (both rear and all-wheel drive versions) with a 360 HP 3.0-liter turbo inline-six, and an M340d xDrive, with a 320 HP 3.0-liter straight-six diesel. Either one of these two could actually be the prototype we see in the image above. 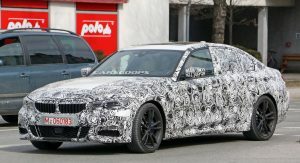 As for the flagship model, that’s going to be the M3, which is expected to house a 500 HP straight-six unit with water injection. 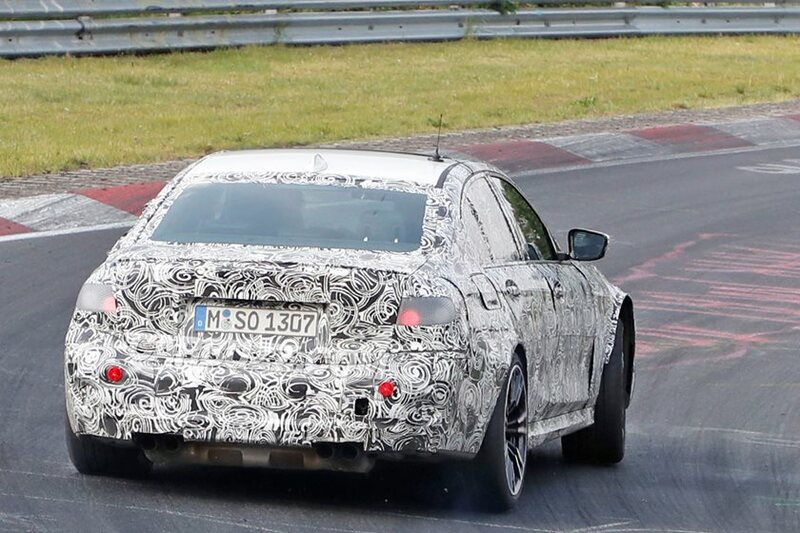 BMW’s test driver shows off his sideways driving skills in these latest next-gen M3 spy shots. The Competition versions of the M2 and M5 may be stealing the spotlight right now, but don't forget there will be a new BMW M car on the block in a few years. We’re talking of course about the brand-new BMW M3, which is expected to debut either in 2019 or early 2020. 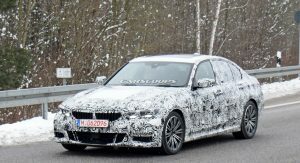 Truth be told, not much is known about BMW’s upcoming sports sedan, codenamed the G80, but we’ve been treated to new images of it in action after our spies caught a test driver powersliding an M3 prototype around the Nurburgring. For “work” purposes, of course. Welcome to the life of a test driver everyone. 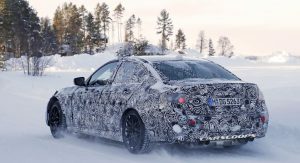 There’s a good chance the next-gen M3 could adopt the M5’s xDrive system giving the ability to switch between all- and rear-wheel drive, though nothing is official yet. Alternatively, it could be reserved for a higher-end model. Clearly though, it’s the rear wheels that are getting a workout in this test session. This is still a very early production prototype, as evidenced by the two different sets of wheels and brake calipers that don’t match. 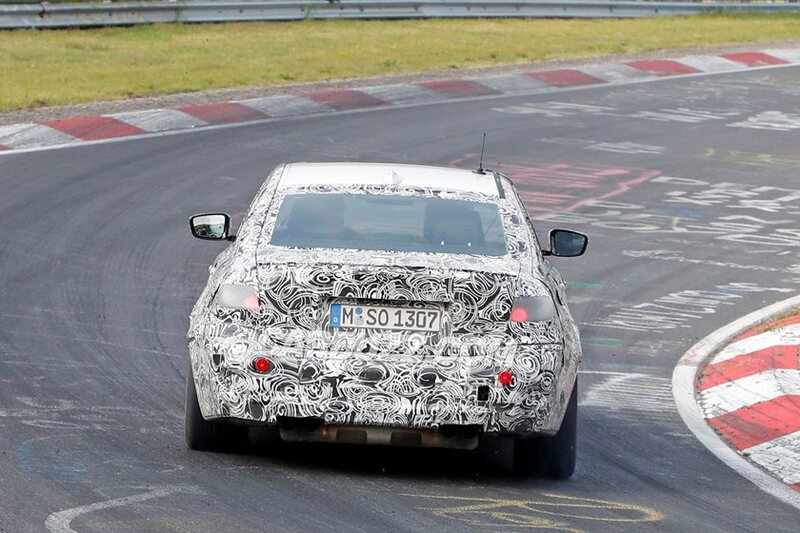 Thick layers of camouflage prevent us from analyzing the styling details, though the larger wheel arches suggest it will be wider than the current model. 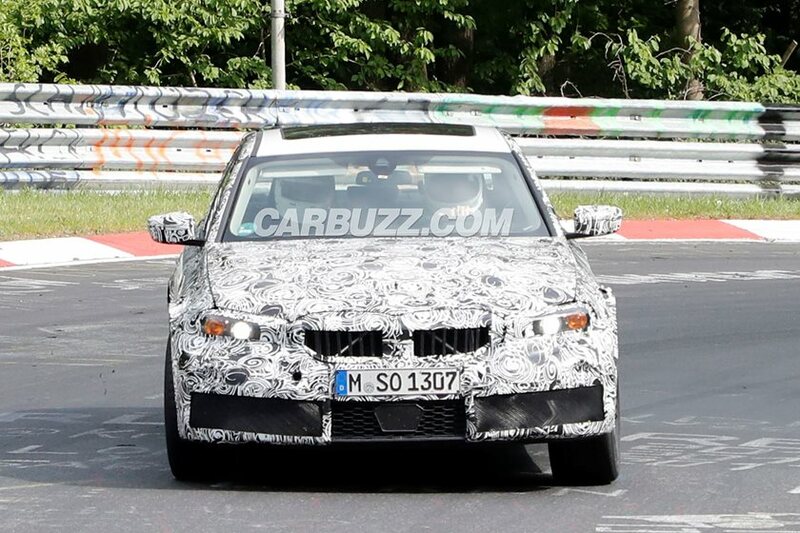 In terms of powertrains, rumors suggest the sixth-generation M3 will be powered by an upgraded version of BMW M’s twin-turbo 3.0-liter inline six-cylinder unit mated to either a standard six-speed manual or an optional eight-speed automatic. Other rumors have suggested it will be a mild hybrid with a 48-volt electric system. Power output could also increase to 500 horsepower, which would be a welcome increase over the current 453-hp M3 CS. 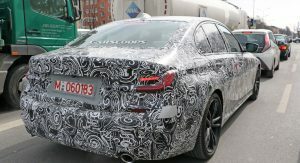 While the all-new M3 won’t break cover until next year at the earliest, the standard next-generation 3 Series is expected to debut before the end of this year. Watch out Mercedes and Audi, BMW is about to come after your C-Class and A4 with a brand spanking new 3 Series. 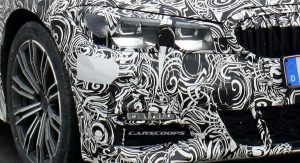 The reveal is scheduled to take place in the latter half of this year, which is why near-production prototypes have put on new camo attire revealing a little bit more of the skin. 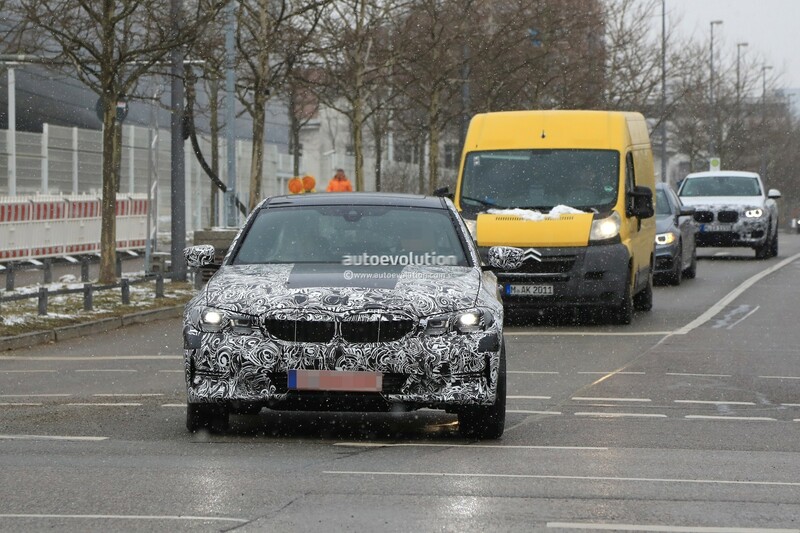 The same disguise is being used on another upcoming hot product from the Land of Bavaria, the X7, so it looks like future BMW models undergoing final testing are being dressed in this black and white camo with a grid pattern. We are being given the privilege to check out the swanky new headlights flanking a redesigned grille with the two kidneys meeting in the middle. 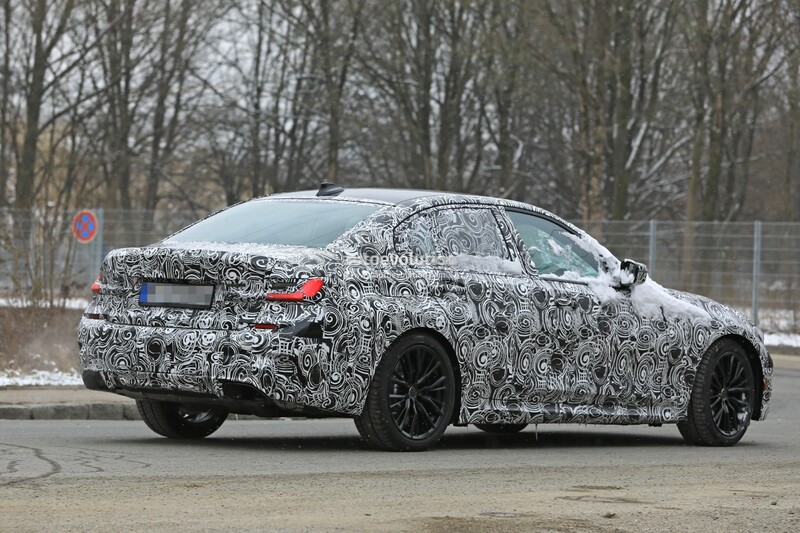 The side profile doesn’t reveal a great deal, other than the fact the prototype could have used a bigger set of alloy wheels, but we’re sure the final 3 Series will be available with bigger rims. 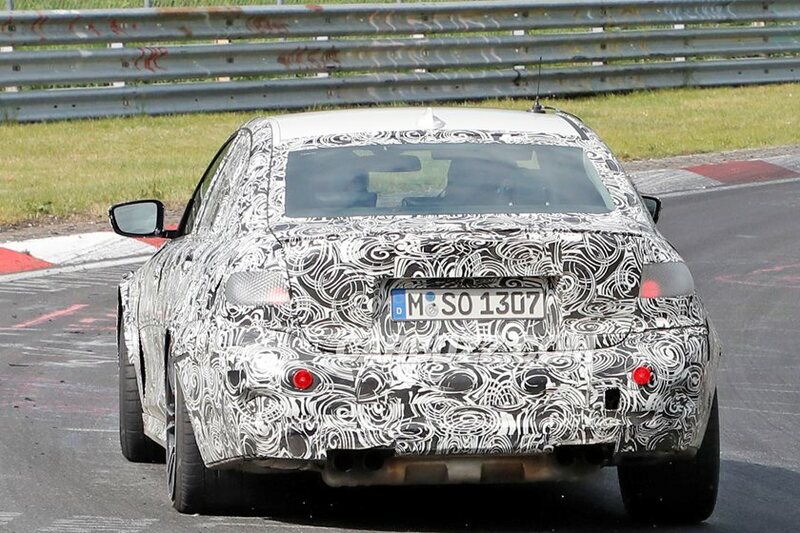 A slight stretch of the wheelbase is expected and that should come along with longer rear doors, although it’s not obvious in these spy shots. We can see the upper character line at the door handle level and how it extends all the way back to meet the redesigned taillights featuring a high-tech look from what we can see through the camo. Unless the disguise is playing tricks on us, the center of the trunk lid appears to be slightly more curved compared to the outgoing model. It continues to incorporate a section of the taillights, although these are mostly hidden underneath the black and white tape. Overall, the styling won’t represent a significant departure from the model is about to replace (it’s a German car after all), but it should have enough changes worthy of a new generation. 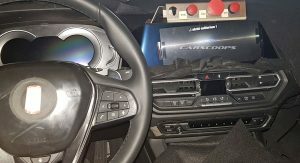 Photos depicting the interior cabin are not available in this set, but our spies spotted a different prototype at the beginning of the month with a partially digital instrument cluster and a revamped center console with a bigger screen for the iDrive infotainment system. The biggest changes will not be visible to the naked eye as probably the most important novelty will be represented by the switch to the CLAR platform already underpinning its bigger brother, the 5 Series. It should enable a healthy weight loss of around 40 kilograms (88 pounds) granted by a more extensive use of aluminum and a little bit of carbon fiber. A roomier interior cabin is likely on the agenda as well, along with a revamped engine lineup that may have been leaked several months ago. Needless to say, the crown jewel of the BMW 3 Series Sedan family will once again be the M3, which was caught just last week while powersliding through the difficult corners of the Nürburgring. 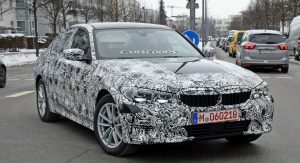 Expect to see the standard 3 Series models debut as early as the beginning of October at the Paris Motor Show, with the M3 to arrive in the second half of 2019 or the beginning of 2020. 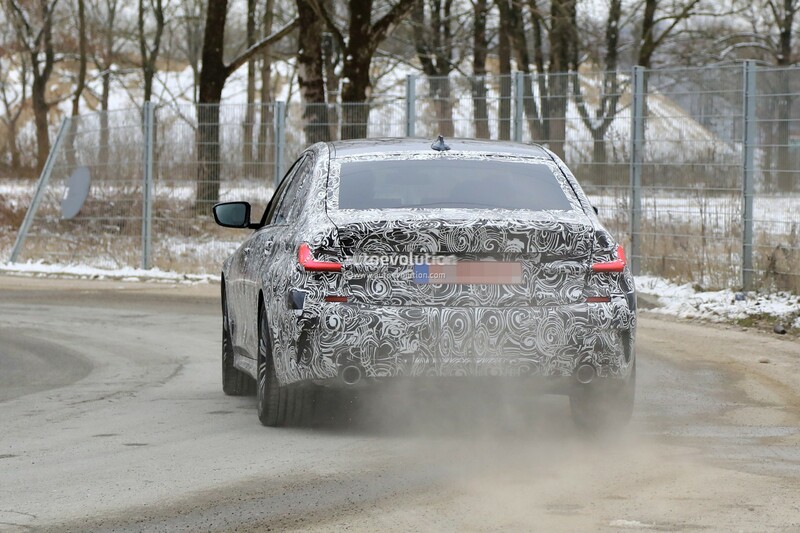 The next-generation BMW 3 Series is getting very close to production, and these latest spy photos give us our best look at the newest compact luxury car from the company. This is the first time we've seen the wagon variant, and it lacks much in the way of camouflage. It only has a thin vinyl wrap, no fake panels, and what appears to be completely production parts underneath. Unsurprisingly, the car looks very much like a BMW. It has the trademark twin-kidney grille and a modest collection of creases, both convex and concave. Compared with the current 3 Series, though, the grille is much larger, both in width and height. 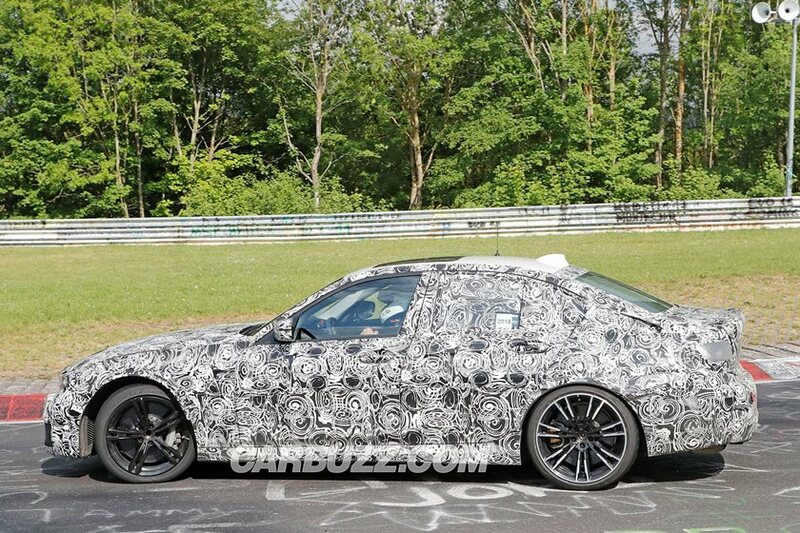 The added width in particular tie it to the new 8 Series and upcoming Z4. The headlights have been made larger and meet up with each side of the grille, unlike the current model, which has a strip of chrome to connect the different parts. The flanks of the car look about the same as the current model. But it looks like the Hofmeister kink in the rear pillar has been significantly toned down. The lower window line also appears to have a steeper rise than the current model. The rear fender has a fairly aggressive looking width to it. Continuing the conservative update is the back end. The biggest difference is in the taillights. Though they have a similar outline to the current car, the rear lighting units are much slimmer and have more sculpting. The various creases and angles of the hatch aren't much different either, except for being a little more crisp and defined. 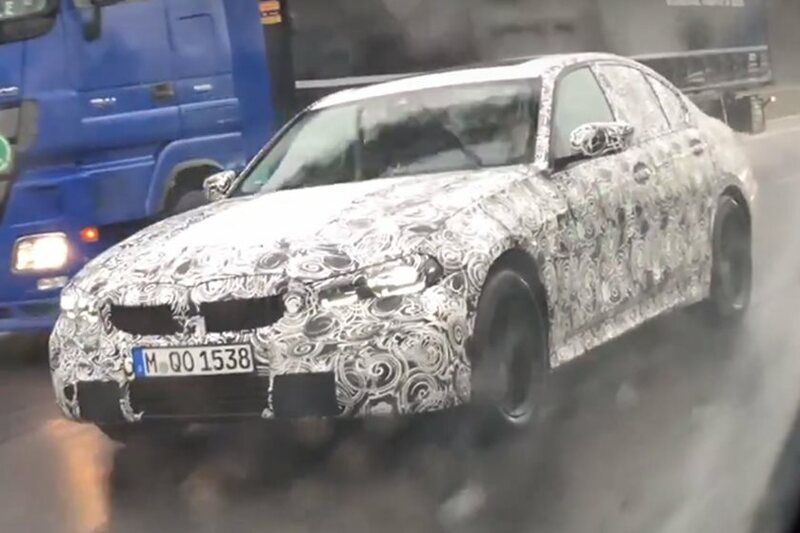 We expect the production BMW 3 Series to be shown by the end of the year, and this very finished looking prototype seems to support that expectation. Since BMW still offers a 3 Series wagon in the U.S., we expect that it will do so with this new generation, too. However, powertrain choices will probably continue to be slim. The car is currently only available in all-wheel-drive, automatic form here with either a gas or diesel turbocharged four-cylinder. Considering the state of diesel in America, it's certainly possible that the diesel will be dropped for the U.S.